Evolution of morphogenesis is generally associated with changes in genetic regulation. Here, we report evidence indicating that dorsal closure, a conserved morphogenetic process in dipterans, evolved as the consequence of rearrangements in epithelial organization rather than signaling regulation. In Drosophila melanogaster, dorsal closure consists of a two-tissue system where the contraction of extraembryonic amnioserosa and a JNK/Dpp-dependent epidermal actomyosin cable result in microtubule-dependent seaming of the epidermis. We find that dorsal closure in Megaselia abdita, a three-tissue system comprising serosa, amnion and epidermis, differs in morphogenetic rearrangements despite conservation of JNK/Dpp signaling. In addition to an actomyosin cable, M. abdita dorsal closure is driven by the rupture and contraction of the serosa and the consecutive microtubule-dependent seaming of amnion and epidermis. Our study indicates that the evolutionary transition to a reduced system of dorsal closure involves simplification of the seaming process without changing the signaling pathways of closure progression. For a single fertilized egg to become an animal with many millions of cells, complex networks of genes must control the different stages of development. These gene networks create all the patterns needed to form different parts of the body. Changes to these patterns can create new species, with different sizes, body shapes, colors and lifestyles. Researchers often examine how evolution can create new species by altering gene networks to change patterns of development. Yet, some differences in development may not directly result from changes to gene networks. Other causes could include how the tissues are organized to begin with. One way to better understand this kind of difference is to compare developmental processes between two or more related species. Dorsal closure, for example, is a stage in a fly’s development when one layer of cells – the epidermis – closes over the back of the developing embryo. Dorsal closure in the scuttle fly (Megaselia abdita) involves the epidermis and two other layers of cells, yet it only involves one other cell layer in the vinegar fly (Drosophila melanogaster). The different number of layers means that dorsal closure must happen differently in the two species. Yet, Fraire-Zamora et al. now report that the genetic control behind the process is very similar in both species. Instead, it is differences in the arrangement and shape of cell layers that lead to the changes in dorsal closure. Dorsal closure involves physical changes to several cell layers, and is driven by protein structures that give shape and strength to cells. These findings highlight how living systems adapt to evolutionary changes. Fraire-Zamora et al. suggest that the same concepts could be adapted further, helping to design and build complex organs in the laboratory. This in turn could help scientist develop new approaches to repairing tissues and healing wounds. Mechanical forces produced at the cellular level are known to shape tissues during morphogenesis (see Lecuit et al., 2011, for a recent review). Molecular motors and cytoskeletal elements generate these mechanical forces, which cause tissues to deform and change shape (Mammoto and Ingber, 2010). Until recently, such tissue-level aspects of morphogenesis have received relatively little attention in the field of evolutionary developmental biology. The evolution of developmental processes is generally attributed to changes in genetic regulation (see for example, Carroll et al., 2009; Davidson and Erwin, 2006; Peter and Davidson, 2015; Wilkins, 2002). To date, it is not fully understood how a developing organism integrates the mechanical and genetic factors necessary to shape a tissue, or how this interplay between tissue mechanics and genetics is contributing to the evolution of development. We focus on this latter aspect by studying how a continuous epidermal layer is formed by epithelial fusion during dorsal closure in a non-model organism, the scuttle fly Megaselia abdita (Diptera: Phoridae). Epithelial fusion is a fundamental morphogenetic mechanism in animal development where two opposing epithelial sheets are brought together to subsequently seam and result in a single continuous epithelial layer (Jacinto et al., 2001). Dorsal closure in Drosophila melanogaster (Diptera: Drosophilidae) is a classical model system to study epithelial fusion (Jacinto et al., 2000). This process is promoted by the mechanical action of different players: a contractile actomyosin cable forming at the leading edge of the epidermal flanks, the extraembryonic amnioserosa which covers the dorsal opening and generates contractile forces during epidermal flank advancement, and the eventual seaming of the epidermis through a mechanism involving microtubule-based cellular protrusions (Eltsov et al., 2015; Hutson et al., 2003; Kiehart et al., 2000; Saias et al., 2015). Genetically, the c-Jun N-terminal kinase (JNK) pathway and the transforming growth factor beta (TGF-β) family gene decapentaplegic (dpp) play an essential regulatory role in the process (Fernández et al., 2007; Glise and Noselli, 1997; Jacinto et al., 2002; Knust, 1997). The expression of dpp localizes to the leading edge of the epidermal flanks and depends on the activity of the D. melanogaster JNK gene (basket, bsk). Embryos lacking bsk activity show downregulation of dpp at the epidermal leading edge, failure of dorsal closure progression, and a dorsal-open phenotype in the larval cuticle (Glise and Noselli, 1997; Sluss et al., 1996). At the molecular level, activation of the JNK/Dpp signaling pathways promotes the formation and maintenance of the actomyosin cable at the epidermal leading edge (Ducuing et al., 2015) and, thus, progression of the opposing epidermal flanks toward the dorsal midline where they meet. At the final stage of dorsal closure, the opposing epidermal flanks ‘zipper’ or ‘seam’ through the action of microtubules that align toward the dorsal opening and promote the formation of filopodial protrusions at both epidermal leading edges (Jacinto et al., 2002; Jankovics and Brunner, 2006; Millard and Martin, 2008). Dorsal closure is a conserved morphogenetic process that occurs in all insects (Chapman, 1998). Although in D. melanogaster it involves two tissues, the embryonic epidermis and the extraembryonic amnioserosa, in most insects it involves three: the embryonic epidermis, an extraembryonic amnion, and a separate extraembryonic serosa (Panfilio, 2008; Schmidt-Ott and Kwan, 2016). These complex anatomical differences raise the question whether the mechanisms responsible for epithelial fusion in a simple two-tissue system are conserved in a three-tissue system. The phorid scuttle fly M. abdita (placed in an early branching cyclorraphan lineage) presents a three-tissue system of dorsal closure and has been established as a model to study the evolution of developmental processes (Bullock et al., 2004; Rafiqi et al., 2008; Schmidt-Ott et al., 1994; Stauber et al., 2000; Wotton et al., 2015). Thus, M. adbita offers the opportunity to compare the three-tissue system of dorsal closure to the two-tissue system present in D. melanogaster. Here, we perform a quantitative characterization of dorsal closure in M. abdita. 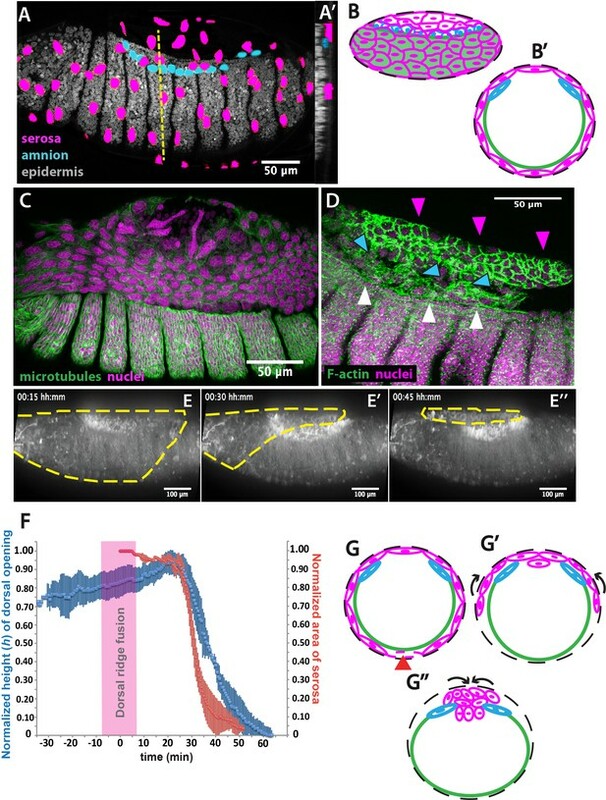 Combining molecular tools with live imaging, we show that dorsal closure in M. abdita embryos occurs in three distinct phases: (i) serosa rupture and retraction, (ii) serosa contraction and progression of opposing epidermal flanks, and (iii) a dual seaming process to eventually form a fused continuous epidermis. Despite the significant morphological differences with D. melanogaster, the regulation of dorsal closure in M. abdita involves a conserved role for the JNK/Dpp signaling pathway to form and maintain an epidermal actomyosin cable surrounding the dorsal opening. More specifically, we find that following an actomyosin-dependent contraction of the serosa, two consecutive microtubule-dependent seaming events take place in the amnion as well as in the epidermis. In both cases, apical microtubule bundles align and extend toward the site of closure suggesting a general epithelial fusion mechanism. Altogether, our results provide a dynamic and quantitative description of epithelial fusion in a complex three-tissue system. They indicate that the evolutionary transition from a three-tissue to a two-tissue system of dorsal closure involves changes in the number and sequence of morphogenetic events, rather than changes in the spatio-temporal activity of the main signaling pathways that control closure progression. In order to map the spatial arrangement of tissues involved in dorsal closure of M. abdita embryos, we obtained confocal projections of fixed non-devitellinized embryos with stained nuclei. Nuclear anatomy and staining have been used previously to identify extraembryonic tissues in the flour beetle Tribolium castaneum (Panfilio et al., 2013). In M. abdita, staining fixed embryos with the nuclear dye DAPI allowed us to distinguish three types of tissues: (1) The extraembryonic serosa, which constitutes the outermost extraembryonic layer and envelops the entire M. abdita embryo before the onset of dorsal closure (magenta in Figure 1A, A’ and and B,B’). Its cells have very large nuclei (average size 125± 21 µm2, SD, n = 150 cells) and show discontinuous or ‘punctuated’ DAPI staining (magenta in Figure 1A and A’ and Figure 1—figure supplement 1A–A’ and B–B’’). (2) The extraembryonic amnion, which is one to two cells wide, localizes in between the serosal and epidermal tissues (blue in Figure 1A, A’ and and B,B’). Its cells also have large nuclei (average size 77 ± 16 µm2, SD, n = 150 cells) and show a more continuous, ‘compact’ DAPI staining (blue in Figure 1A and A’ and Figure 1—figure supplement 1A–A’ and B–B’’). (3) The embryonic epidermis, which contains numerous small nuclei (average size 14 ± 3 µm2, SD, n = 150 cells) that are tightly packed (gray in Figure 1A and A’). The extraembryonic serosa ruptures and accumulates dorsally previous to epidermal seaming in Megaselia abdita. (A) Nuclear staining of M. abdita embryos prior to dorsal closure reveals three types of tissues: the extraembryonic serosa (magenta), the extraembryonic amnion (blue), and the embryonic epidermis (gray). (A’) An orthogonal re-sliced stack along the dashed yellow line in A shows the position of the embryonic (gray), amniotic (blue), and serosal (magenta) tissues in transverse view. (B) Schematics depicting the organization of the serosa cells (magenta), amnion cells (blue), and embryonic epidermis (green) in lateral and (B’) transverse view. The black dashed line represents the vitelline envelope (C) M. abdita embryo undergoing rupture and retraction of serosal tissue along the ventral side. Staining against β-tubulin in green, and DAPI nuclear counterstain in magenta. (D) Serosal cells (magenta arrowheads) accumulate on the dorsal side of the embryo after rupture. The serosa remains apposed to the amnion (blue arrowheads), which is in turn apposed to the embryonic epidermis (white arrowheads). Phalloidin stain in green and DAPI nuclear counterstain in magenta. (E) Images from a time-lapse sequence of serosa retraction in a M. abdita embryo injected with the fluorescent lipophilic dye FM 4–64 (from Video 1). Yellow dashed line shows the contour of the serosa covering the embryo during retraction. (F) Relative changes in area of the serosa during retraction (red, n = 15 embryos), and relative changes in height (h) of the dorsal opening (blue, n = 15 embryos) during dorsal closure in M. abdita. Vertical bars represent standard deviation (SD). Time range of dorsal ridge fusion is represented by pink area (n = 15 embryos) as a landmark for the initiation of dorsal closure. The origin of the time axis (T = 0 min) is set at the point of serosa rupture. (G) Schematics depict transverse views of embryos during serosa rupture, retraction, and dorsal accumulation. Serosal cells rupture along the ventral end of the embryo (red arrowhead). (G’) The remaining lateral serosa cells retract towards the dorsal side (black arrows). (G’’) Serosa cells continue retracting until they completely accumulate onto the dorsal opening (black arrows). Color scheme as in B. In all embryos and schematics, dorsal is to the top. Embryos in A, C, D and E show lateral views where anterior is to the left. In order to obtain a closer view of the spatial arrangement of tissues in live M. abdita embryos, we injected DAPI at the embryo poles during dorsal closure stage and obtained confocal projections. This staining showed that amnion cells sit on top of yolk granules and are positioned adjacent to the embryonic epidermis (blue arrowheads in Figure 1—figure supplement 1C–C”). When fixing M. abdita embryos at dorsal closure stage, devitellinization also removes the serosa together with the vitelline membrane (Figure 1—figure supplement 2A). Devitellinization and serosa cells removal resulted in a gap on the dorsal side of the embryo, seen as lack of phalloidin staining (Figure 1—figure supplement 2B). Amnion cells (1–2 cell rows adjacent to the epidermis, blue arrowheads in Figure 1—figure supplement 2B) remained apposed to an intact epidermis. In a few cases, devitellinization left some intact serosa cells on top of M. abdita embryos (very large cells highlighted by phalloidin and DAPI counterstains, white arrowhead in Figure 1—figure supplement 2C and C’). An optical re-slice of confocal projections of the intact serosa and amnion cells showed that these two cells types are apposed (yellow arrowhead in Figure 1—figure supplement 2C’’). In summary, the anatomy of M. abdita embryos at dorsal closure reveals a three-tissue system, where large serosa cells surround the embryo and are apposed to the amnion cells at the dorsal-most end of the embryo. Amnion cells form a row, in turn apposed to the adjacent epidermis (Figure 1B and B’). This three-tissue geometry poses an interesting challenge for the process of dorsal closure, since the apposed serosa and amnion need to undergo dramatic rearrangements to achieve epidermal fusion at the end of dorsal closure. How does M. abdita solve this problem? At early stages of dorsal closure, the serosa surrounding the embryo undergoes an abrupt rupture (Wotton et al., 2014). Serosa rupture initiates close to the posterior pole of the embryo. Spread of the rupture occurs anteriorly through the ventral side of the embryo and results in a retraction of the serosa toward the dorsal end of the embryo (Figure 1C). During this process, serosa cells accumulate at the dorsal opening (magenta arrowheads in Figure 1D, and magenta cells in 1 G-G’’). In the meantime, the amnion remains in place, apposed to the serosa (blue arrowheads in Figure 1D, and blue cells in 1 G-G’’), and adjacent to the embryonic epidermis (white arrowheads in Figure 1D, and green line in 1 G-G’’). To gain quantitative evidence on the dynamics of dorsal closure in M. abdita, we labeled live embryos with the fluorescent lipophylic dye FM 4–64 and followed the process using confocal imaging (Video 1). We used the fusion of the dorsal ridge (merging of the ridge primordia at the dorsal midline, magenta bar in Figure 1—figure supplement 3A and A’) as a developmental landmark for the initiation of dorsal closure (T = 0 min) (Campos-Ortega and Hartenstein, 1997; VanHook and Letsou, 2008). Under this time frame, the serosa ruptures at T = 25 min (±8 min, SD; n = 15 embryos) and dorsal closure (seaming of the embryonic epidermal flanks at the dorsal midline, see yellow line in Figure 1—figure supplement 3A’’) concludes at T = 74 min (±10 min, SD, n = 15 embryos). Dorsal closure in Megaselia abdita involves the rupture and retraction of the serosa and advancement of the epidermal flanks to the dorsal midline. Time-lapse sequence of dorsal closure in two M. abdita embryos injected with the fluorescent label FM 4–64. Top: serosa rupture and retraction in lateral view. Rupture initiates at a ventral-posterior location and spreads anteriorly along the ventral side of the embryo. The ruptured serosa accumulates on the dorsal side, where epidermal seaming occurs at the end of dorsal closure. Bottom: dorsal view of the initiation of dorsal closure, marked by the fusion of the dorsal ridge and straightening of the epidermal leading edge (see Figure 1—figure supplement 3A). Epidermal flanks are brought together to the dorsal midline where epidermal seaming occurs. In both embryos, anterior is to the left. To relate serosa retraction to the kinetics of dorsal closure, we measured the relative changes in area of the serosa covering the embryo and the relative changes in height (h) of the dorsal opening over time (see red and blue curves in Figure 1F, yellow dashed line in Figure 1E, blue line in Figure 1—figure supplement 3A- and Materials and methods). At early stages of dorsal closure, the leading edge of the epidermis straightens (yellow line in Figure 1—figure supplement 3A and A'') and the dorsal opening increases progressively in height (h) (blue curve in Figure 1F). After dorsal ridge fusion (pink area in Figure 1F), the serosa ruptures, retracts and accumulates onto the dorsal opening (Figure 1C, magenta arrowheads in 1D, yellow dashed line in 1E, magenta cells in 1G’-G’’). This is concurrent with a fast reduction in dorsal opening height (red and blue curves in Figure 1F, yellow line in Figure 1—figure supplement 3A and A''). Visualizing the process from an orthogonal view, we observe that following serosa accumulation on top of the dorsal opening, this extraembryonic tissue bends inwards and serosa cells undergo an apicobasal elongation resulting in the internalization of a large part of the serosa cells into the yolk prior to epidermal fusion (Video 2 and Figure 1—figure supplement 3B and C–C’). Optical re-slices of confocal projections along the anterio-posterior axis of fixed embryos show that extraembryonic tissues internalizes during dorsal closure and do not accumulate underneath the fused epidermis after completion of the process (Figure 1—figure supplement 4). Thus, at late dorsal closure stages, the serosa is fully internalized (magenta cells in Figure 1G’’) and the two epidermal flanks continue progressing toward the dorsal midline, covering the dorsal opening and eventually fusing completely (Figure 1—figure supplement 3A''). The extraembryonic serosa of Megaselia abdita embryos internalizes into the yolk prior to epidermal seaming. Time-lapse sequence of a dorsal (top) and orthogonal view (bottom) of an FM 4–64-labeled embryo. After serosa rupture and accumulation at the dorsal opening, the extraembryonic tissue internalizes into the yolk, as observed by an inward bending of the tissue and apicobasal cell elongation. Upon internalization of the serosa, the epidermal flanks advance and fuse at the dorsal midline. In the dorsal view, anterior is to the top. In the orthogonal view, dorsal is to the top. Since the JNK and Dpp signaling pathways are known to regulate dorsal closure in D. melanogaster embryos, and their impairment results in the failure of dorsal closure and in a dorsal-open phenotype (Glise and Noselli, 1997; Sluss et al., 1996), we wondered whether JNK and Dpp signaling would also be important regulators of dorsal closure and serosa retraction in M. abdita embryos. 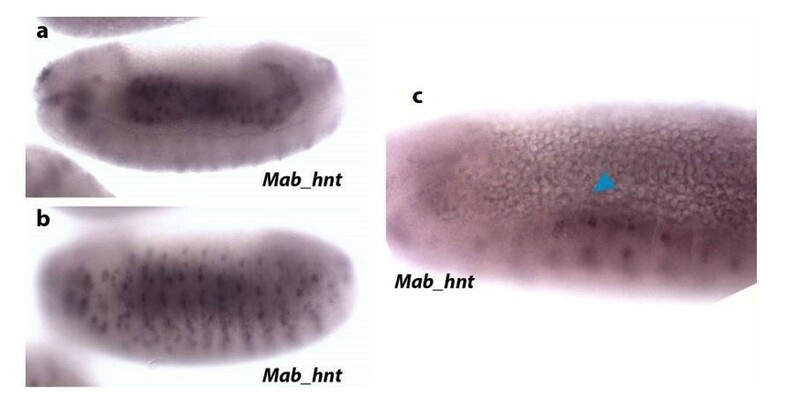 Using in situ hybridization and cuticle preparations, we observed that in wild-type embryos, M. abdita dpp (Mab_dpp) is expressed along the leading edge of the epidermis (black arrowheads in Figure 2A) and progression of dorsal closure results in the deposition of a continuous larval cuticle (Figure 2A’), very similar to D. melanogaster. Next, we perturbed the M. abdita JNK pathway, using gene knockdown by RNA interference (RNAi, see Materials and methods) against M. abdita bsk (Mab_bsk) in pre-gastrulating embryos. Around 90% of Mab_bsk dsRNA-injected embryos developed to at least germband retraction stage (821 out of 922 embryos). Mab_bsk RNAi knock-down resulted in both a disrupted pattern of Mab_dpp expression (including a complete absence of expression at the leading edge of the epidermis, magenta arrowheads in Figure 2B) and a dorsal-open phenotype in the larval cuticle (magenta arrowheads in Figure 2B’) of ~64% of RNAi-injected and developed embryos (528 out of 821 embryos). Both phenotypes are similar to the ones that occur in D. melanogaster embryos after JNK/Dpp signaling perturbation. Interestingly, live imaging of RNAi-injected embryos reveals that serosa rupture and retraction still occur (yellow dashed line in Figure 2C–C’’ and Video 3), despite a failure of progression of the epidermal flanks (yellow arrowheads in Figure 2—figure supplement 1B; note that the embryo from Video 3 and Figure 2C corresponds to the same embryo in Figure 2—figure supplements 1B, 24 hr after RNAi injection). In summary, these results indicate that JNK and Dpp signaling regulate progression of dorsal closure in M. abdita as in D. melanogaster embryos but are not required for the regulation of serosa rupture and retraction. JNK (bsk) is required for dpp expression and the completion of dorsal closure without affecting serosa rupture or retraction in Megaselia abdita. (A) Wild-type expression of Mab_dpp (purple stain, black arrowheads) along the dorsal leading edge of the epidermis in a M. abdita embryo (lateral view) during dorsal closure. (A’) Cuticle preparation of a wild-type late-stage pre-hatching M. abdita embryo (dorsal view). (B) RNAi knock-down of Mab_bsk abolishes Mab_dpp expression at the leading edge of the epidermis (magenta arrowheads) in a M. abdita embryo (lateral view). (B’) Cuticle preparation of a Mab_bsk RNAi late-stage pre-hatching embryo, showing a dorsal-open phenotype (magenta arrowheads). (C) Images from a bright-field time-lapse sequence of serosa retraction in a M. abdita embryo treated with Mab_bsk RNAi (from Video 3). Yellow dashed lines show the perimeter of the serosa covering the embryo during retraction. In all embryos and cuticles anterior is to the left and dorsal to the top. Knock-down of Mab_bsk by RNAi does not prevent serosa rupture and retraction despite preventing epidermal flanks from closing in Megaselia abdita embryos. Bright-field time-lapse sequence of serosa retraction in a M. abdita embryo injected with Mab_bsk dsRNA at early stages of development. Embryo in lateral view. Anterior is to the left, dorsal to the top. In D. melanogaster embryos, both a JNK/Dpp-dependent contractile epidermal cable and the contraction of the amnioserosa tissue (through actomyosin contractility and volume decrease) power the progression of dorsal closure (Hutson et al., 2003; Kiehart et al., 2000; Saias et al., 2015). The actomyosin cytoskeleton is therefore an essential component in force generation during this process. To gain insights into the structures generating forces during dorsal closure in M. abdita, we stained fixed embryos with phalloidin (to reveal F-actin) or a phosphoMyosin antibody. Both stains showed accumulation at the leading edge of the epidermis (green arrowheads in Figure 3A and B) and at the surface of serosa cells during internalization (red arrowheads in Figure 3A and B). Measurements from time-lapse sequences showed that serosa cell area reduces over time during their accumulation at the dorsal opening, from an average of 212 ± 52 µm2 (SD; n = 20 cells) to 76 ± 18 µm2 (SD; n = 20 cells) to 33 ± µm2 (SD; n = 20 cells) at 20, 30 and 40 min after serosa rupture, respectively (Figure 3—figure supplement 1B). This cell area reduction correlates with an apical accumulation of actin at early stages of serosa internalization (yellow arrowheads in Figure 1—figure supplement 4a’’, b’’ and c’’), suggesting an apical constriction mechanism through actomyosin contraction during serosa internalization. In contrast, amnion cells show low levels of actin and myosin, even during late stages of dorsal closure after full serosa internalization (blue arrowhead in Figure 3A and B, Figure 3C’’ and Figure 3—figure supplement 1A). Closer observation also reveals the presence of actin-enriched filopodia-like extensions protruding from the actomyosin cable (yellow arrowheads in Figure 3—figure supplement 1C and C’). RNAi knock-down of Mab_bsk strongly reduces the level of actin accumulation at the epidermal leading edge compared to wild-type embryos (white arrows in Figure 3—figure supplement 2A and B). This suggests that the embryonic epidermal cable is similar in structure and regulated by the JNK/Dpp signaling pathway in both M. abdita and D. melanogaster embryos. An actomyosin-enriched epidermal cable is necessary for the completion of dorsal closure upon contraction, retraction, and internalization of the serosa in Megaselia abdita. (A) F-actin enrichment (as observed by inverted intensity of phalloidin staining) and (B) PhosphoMyosin enrichment (inverted intensity of immunostaining) in the epidermal leading edge (green arrowhead) and internalizing serosa (red arrowhead), but not in the amnion (blue arrowhead) of a M. abdita embryo during dorsal closure. (C–C’’’) Time series of different phalloidin-stained M. abdita embryos that show merging of both amniotic and epidermal flanks brought together at the dorsal midline upon serosa internalization. Amniotic merging (blue arrowheads) is visible by a transient accumulation of F-actin (white arrowhead in C’’). Epidermal merging is mediated by the actomyosin cable (yellow arrowheads). (D) Average area of the serosa during retraction in wild-type control (red, n = 15 embryos), and contractility-impaired embryos injected with Y-27632 (purple, n = 15 embryos). The latter show delayed and incomplete serosal retraction and ingression. Vertical bars represent standard deviations (SD). Embryos from A to D are in dorsal view where anterior is to the left. Embryo in D’ is an optical transverse view where dorsal is to the top. 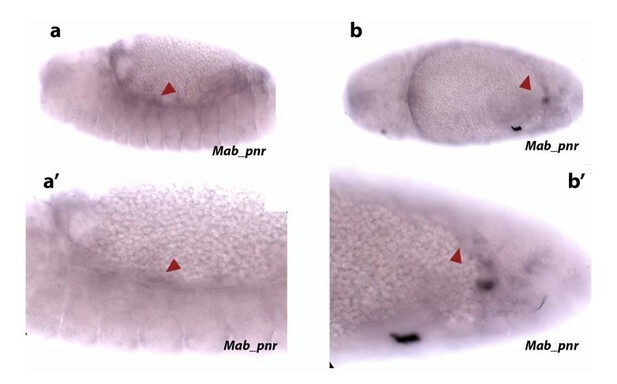 A timed sequence of phalloidin-stained M. abdita embryos (Figure 3C–C’’’) reveals further details concerning the dynamics of dorsal closure: upon serosa internalization, the amniotic flanks (devoid of actomyosin) move to the dorsal midline where the two flanks merge (white arrowhead in Figure 3C’’). Upon merging of amnion flanks, the actomyosin cable propels the epidermal flanks to the dorsal midline where epidermal seaming takes place (yellow arrowheads in Figure 3C’, C’’ and C’’’). To affect actomyosin-based tissue contractility, we injected M. abdita embryos with the Rho kinase (ROCK) inhibitor Y-27632. This drug has been extensively used in D. melanogaster to inhibit actomyosin contractility by blocking ROCK activity and, consequently, downstream targets including myosin phosphorylation (Czerniak et al., 2016; Monier et al., 2010; Sommi et al., 2011). Injection of Y-27632 at early stages of M. abdita dorsal closure reduces actomyosin accumulation at the epidermal leading edge compared to wild-type embryos (white arrowheads in Figure 3—figure supplement 2A and C). The progression of the epidermal leading edge is arrested upon treatment (Figure 3—figure supplement 2D–D’’ and Video 4). The internalization of serosa cells is also abolished as observed by the lack of inward bending and apicobasal elongation of this tissue in orthogonal view (Figure 3—figure supplement 2E–E’’ and Video 5). These observations indicate that actomyosin contractility contributes to both the internalization of the serosa and progression of the epidermal leading edge. Interestingly, the kinetics of serosa retraction in Y-27632-injected embryos seemed less affected during the first half of the process than the second half (purple curve in Figure 3D), suggesting that actomyosin-based cell contraction is taking place mainly at the final stage of retraction and during serosa internalization. Injection of the Rho kinase inhibitor Y-27632 prevents dorsal closure and slows down serosa retraction in Megaselia abdita. Time-lapse sequence of dorsal closure in a FM 4–64-labeled M. abdita embryo injected with the Rho kinase (ROCK) inhibitor Y-27632, which downregulates actomyosin-based contractility. Note the slow rupture and retraction of the serosa, and the failure of the epidermal flanks to advance and close. Embryo in lateral view where anterior is to the left, dorsal to the top. Note that the static stains observed are stains on the vitelline envelope arising from embryo treatment prior to imaging. Injection of the Rho kinase inhibitor Y-27632 prevents internalization of the serosa in Megaselia abdita embryos. Time-lapse sequence of a dorsal (top) and orthogonal view (bottom) of serosa rupture in an FM 4–64-labeled M. abdita embryo. Injection of the Rho kinase (ROCK) inhibitor Y-27632 (to downregulate actomyosin-based contractility) prevents internalization of the serosa. The inward bending and apicobasal cell elongation of the extraembryonic tissue into the yolk is not observed in orthogonal view. In the dorsal view, anterior is to the top. In the orthogonal view, dorsal is to the top. Note that the static stains observed are stains on the vitelline envelope arising from embryo treatment prior to imaging. Taken together, these results indicate that actomyosin-based contractility within the serosa and the cable surrounding the dorsal opening are required for the progression of dorsal closure in M. abdita embryos. In addition to an actomyosin cable, the microtubule cytoskeleton is known to be essential during the last step of dorsal closure in D. melanogaster. In epidermal cells at the leading edge, microtubules align in apical bundles parallel to the dorsoventral axis and protrude into stable filopodia. These aligned epidermal microtubules are required for proper epidermal seaming and their depolymerization leads to defects in seaming and incomplete closure in D. melanogaster (Jankovics and Brunner, 2006). We investigated whether such a microtubule configuration is observable during dorsal closure in M. abdita as well. Staining fixed M. abdita embryos at different stages of late dorsal closure with a β-tubulin antibody, we observed that microtubules in the epidermis also orient toward the dorsal midline (Figure 4—figure supplement 1A and B) and protrude from the epidermal leading edge (white arrowheads in Figure 4—figure supplement 1B) forming apical bundles (Figure 4—figure supplement 1B’). This epidermal microtubule alignment is maintained throughout epidermal flank advancement and during epidermal seaming (Figure 4—figure supplement 1C–C’’’). Interestingly, we find a similar alignment of microtubules in the extraembryonic amnion, where microtubule bundles localize apically (Figure 4B’) and orient toward the internalizing serosa (blue arrowheads in Figure 4A and B and Figure 4—figure supplement 1A). This apical microtubule alignment in the amnion seems to follow cell elongation. To support this observation, we estimated apical cell surface area by performing a Voronoi tessellation around the nuclei of extraembryonic cells. We could observe that amniotic cells present an elongated apical cell surface area (285 ± 81 µm2, SD; n = 12 cells; blue arrowheads in Figure 4—figure supplement 1D) compared to serosa cells (57 ± 23 µm2, SD; n = 108 cells; red arrowheads in Figure 4—figure supplement 1D). 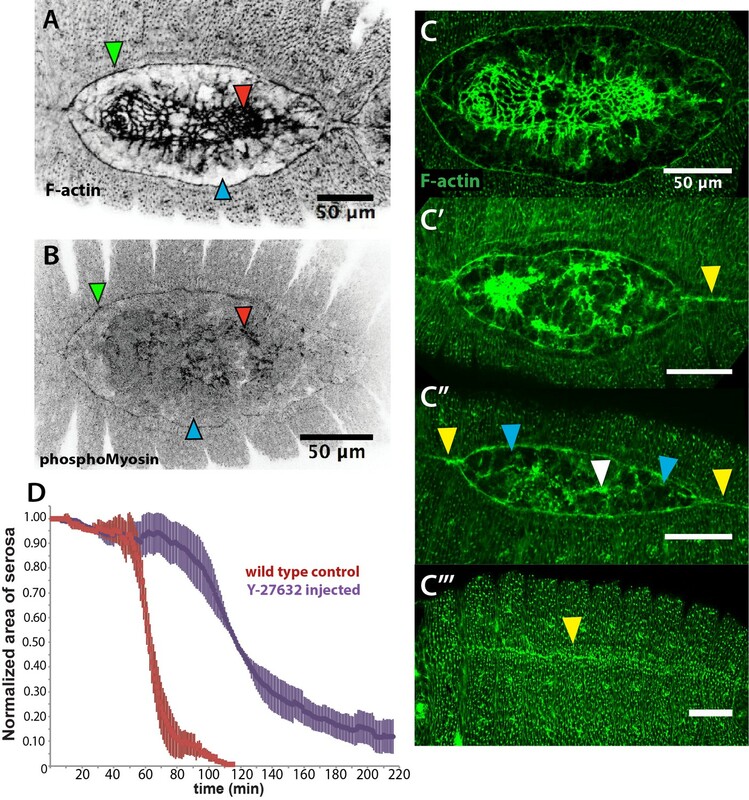 Both apical microtubule alignment and elongated apical cell surface area in the amnion are maintained during serosa internalization and merging of amnion cells from opposite flanks (blue arrowheads in Figure 4B and Figure 4—figure supplement 1C–C’). Amnion microtubule alignment is subsequently lost after the opposite amnion flanks meet at the dorsal midline (blue arrowhead in Figure 4—figure supplement 1C’’). Microtubule-dependent seaming of the extraembryonic amnion is required for subsequent epidermal seaming during dorsal closure in Megaselia abdita. (A) Confocal projections of microtubules in the extraembryonic amnion orienting toward the internalizing serosa during early amniotic seaming. (B) As amniotic seaming progresses, microtubules maintain alignment, and become localized apically, as revealed by a transverse view (B’), obtained by orthogonal stack re-slicing along the blue line in B. Staining against β-tubulin is shown in green, DAPI nuclear counterstain in magenta. (C) Time-lapse sequence of amniotic seaming (blue dashed line and blue shaded area) followed by epidermal seaming (green dashed line) along the dorsal midline in a M. abdita embryo injected with the fluorescent lipophilic dye FM 4–64 (from Video 6). (D) Time-lapse sequence of dorsal closure in a colcemid-treated embryo to induce microtubule depolymerization. After serosa retraction the process is arrested and closure fails. The embryo is labeled by FM 4–64 (from Video 8). White arrowheads in D show the proper straightening of the epidermal leading edge in colcemid-injected embryos. Red arrowhead in D’’ indicates impaired serosa internalization. (E) Relative changes in height (h) of dorsal opening during in wild-type control (blue, n = 15 embryos) and embryos injected with colcemid (red, n = 15 embryos) to depolymerize microtubules. Vertical bars show standard deviations (SD). These measurements reveal failed epidermal leading edge progression in colcemid-treated M. abdita embryos. (F) Schematics depicting the transverse view (top) and dorsal view (bottom) of embryos during serosa cell internalization, initiation of amnion cell elongation, and microtubule alignment (purple) toward the dorsal midline. Black arrows indicate the direction of amnion progression. (F’) Amnion cells show alignment of apical microtubule bundles toward the dorsal midline, where the two amniotic flanks meet, and amniotic seaming occurs (dark blue line). This is followed by the progression of the epidermal leading edge (dark green arrows), which results in epidermal seaming and completion of dorsal closure (not shown). Serosa in magenta, amnion in blue and embryonic epidermis in green. All embryo images show dorsal views where anterior is to the left. Since microtubule alignment is necessary for epidermal seaming during dorsal closure in D. melanogaster, we reasoned that a similar microtubule alignment in the amnion of M. abdita embryos could indicate epithelial amniotic fusion through seaming in this species. To follow the last steps of M. abdita dorsal closure more closely, we imaged FM 4–64-labeled embryos during the late stage of dorsal closure (Video 6). We observed that upon serosa internalization, the opposing amniotic flanks of M. abdita embryos meet and fuse at the dorsal midline, suggesting an amniotic seaming process (blue-shaded area in Figure 4C,C’ and C’’). Immediately after amniotic seaming occurred, the epidermal flanks progressed dorsally and also seamed on top of the continuous amnion (green dashed line in Figure 4C,C’ and C’’). An estimation of seaming velocities in the amnion and epidermis (8.1 ± 2 µm/min and 3.8 ± 1.7 µm/min, SD, n = 5 embryos, respectively) shows a variation in speed between the two processes that could result from a difference in the mechanical properties of the fusing epithelia or the seaming angle at each canthi. Amniotic seaming followed by epidermal seaming during the late stage of dorsal closure in Megaselia abdita. Time-lapse sequence of the final stage of dorsal closure in a M. abdita embryo fluorescently labeled with FM 4–64. The amnion flanks are brought together and seamed at the dorsal midline upon serosa ingression. This process is followed by seaming of the epidermal flanks at the dorsal midline. Both seaming processes initiate at the posterior end of the embryo. Embryo in dorsal view. Anterior is to the left. Note that the static stains observed are stains on the vitelline envelope arising from embryo treatment prior to imaging. To investigate the functional role of microtubules in amnion cell elongation and seaming, we injected embryos with the microtubule depolymerizing drug colcemid (Jankovics and Brunner, 2006). Injection of colcemid does not perturb the kinetics of serosa retraction (Figure 4—figure supplement 2A), actin accumulation in serosa cells (red arrowheads in Figure 4—figure supplement 2B and B’), straightening of the epidermal leading edge (white arrowheads in Figure 4D), or actin cable formation (white arrowheads in Figure 4—figure supplement 2B and B’). 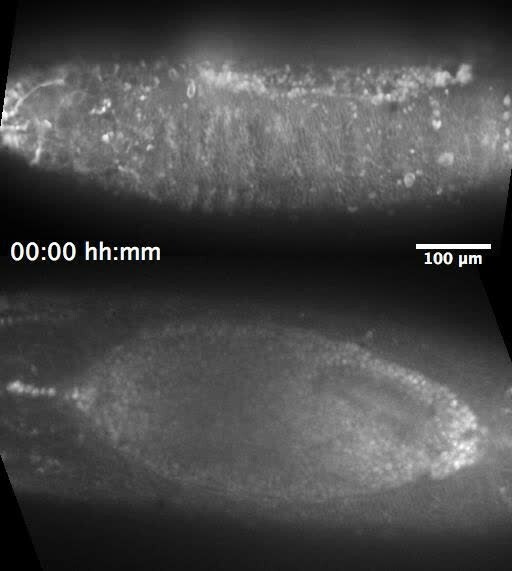 An orthogonal view from a time-lapse sequence also shows that the initial inward bending and apicobasal elongation of the serosa cells during internalization occurs in both wild type and colcemid injected embryos (Video 7 and magenta dashed lines in Figure 1—figure supplement 3C–C’ and Figure 4—figure supplement 2C–C’). The initial stages of serosa internalization in colcemid-injected embryos of Megaselia abdita occur as in wild-type embryos. Time-lapse sequence in orthogonal view of dorsal closure during serosa internalization in FM 4–64-labeled M. abdita embryos. The inward bending of the extraembryonic tissue and apicobasal cell elongation into the yolk is observed in wild-type control (top) and colcemid-injected embryos (bottom). Injection of colcemid induces microtubule depolymerization and impairs the late stages of dorsal closure (see Video 8). Dorsal is to the top. In contrast, dorsal closure arrests during the internalization of the serosa (red arrowhead in Figure 4D’’) and does not progress toward epithelial seaming (Video 8 and red curve in Figure 4E). We observe that microtubule polymerization does not occur in colcemid-injected embryos (blue and white arrowheads for amnion and epidermal cells, respectively, in Figure 4—figure supplement 2D compared to 2D’) and that amnion cells initially elongate toward the dorsal midline as in wild-type conditions, although they relax and retract from the amnion merging site (Figure 4—figure supplement 4A and Video 9). Thus, microtubule depolymerization does not affect amnion cell elongation and dorsal convergence but rather a subsequent amniotic seaming. In order to test the role of the microtubule assembly, specifically in the amnion, we deactivated the depolymerizing effect of colcemid treatment on dorsal closure progression with UV light. UV-irradiation was performed in a region between the epidermis and the internalizing serosa, corresponding to the amnion (magenta area in Figure 4—figure supplement 3A’’ and Video 10). In UV-irradiated embryos, dorsal closure progressed further, reducing the height (h) of the dorsal opening, compared to colcemid-treated embryos, although it did not progress to the extent of wild-type control embryos (Figure 4—figure supplement 3B). Taken together, these observations indicate that the microtubule cytoskeleton in the amniotic tissue is required for seaming of the amnion and the completion of dorsal closure. Colcemid injection prevents dorsal closure in Megaselia abdita. Time-lapse sequence of impaired dorsal closure in an FM 4–64-labeled M. abdita embryo after injection of colcemid to induce microtubule depolymerization. The initial stages of dorsal closure (straightening of the epidermal leading edge and serosa rupture and retraction) are not affected. The process of dorsal closure is aborted during the late stages (amniotic seaming and epidermal seaming). Embryo in dorsal view. Anterior is to the left. Colcemid injection impairs amniotic flank seaming during dosal closure in Megaselia abdita. Time-lapse sequence in lateral view of the latest stages of dorsal closure in FM 4–64-labeled M. abdita embryos. Amnion cell elongation can be observed in a wild-type embryo (top) resulting in the seaming of the amniotic flanks followed by seaming of the epidermal flanks. In colcemid-injected embryos (bottom), amnion cells initially elongate but fail to maintain elongation and retract from the amniotic merging at the dorsal midline. Note that the static stains observed are stains on the vitelline envelope arising from embryo treatment prior to imaging. UV-deactivation of colcemid in the amnion region of treated Megaselia abdita embryos rescues amnion seaming. Time-lapse sequence in dorsal view of dorsal closure in FM 4–64-labeled M. abdita embryos during serosa accumulation and internalization. Colcemid-injected embryos do not complete dorsal closure (top). UV-deactivation of colcemid in a region of interest (ROI) between the epidermal flanks and the internalizing serosa (bottom) rescues serosa internalization. In summary, the results presented in this section indicate the presence of subsequent microtubule-based seaming processes in both the amnion and the epidermis during dorsal closure in M. abdita. First, opposing amniotic flanks fuse at the dorsal midline upon serosa ingression, followed by epidermal seaming (see schematics in Figure 4F and F’ and lower panels of Figure 4—figure supplement 4b–b’’). Both processes are necessary for the completion of epidermal seaming and dorsal closure, to result in a continuous embryonic epidermal sheet. Our results indicate that serosa contraction contributes to bringing amniotic flanks into close proximity and that amniotic seaming is a microtubule-dependent event. In this study, we provide a detailed characterization of epithelial fusion during dorsal closure in the non-drosophilid scuttle fly M. abdita. In this species, dorsal closure involves three different tissues: the embryonic epidermis, as well as the extraembryonic amnion and serosa. Dorsal closure in M. abdita occurs in three distinct phases: (i) rupture and retraction of the extraembryonic serosa surrounding the embryo, (ii) concurrent contraction of both an epidermal actomyosin cable and the serosal tissue in the dorsal region of the embryo leading to internalization of the serosa into the dorsal opening, and (iii) successive seaming processes fusing first the amnion and then the epidermis. 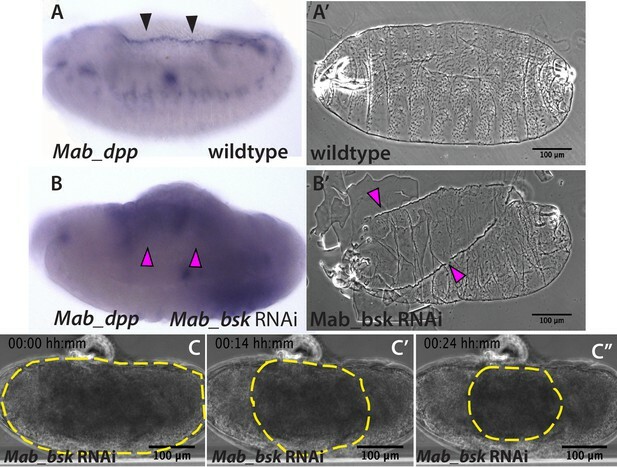 Even though genetic regulation of dorsal closure by the JNK and Dpp signaling pathways appears to be conserved between M. abdita and D. melanogaster, the sequence of morphogenetic rearrangements is very different between the two species. These differences, however, result in the same output: a continuous epidermal layer covering the dorsal region of the embryo. In M. abdita, the serosa encloses the whole embryo. It is apposed to the amnion, which in turn is apposed to the epidermis at the edge of the dorsal opening (schematics in Figure 1B and B’) (see also Rafiqi et al., 2008). The rupture of the serosa is the first step of a series of complex morphogenetic events (see Figure 4—figure supplement 5). Although the initiation signal for serosal rupture is not yet known, we can discard a purely mechanical trigger since injection of the embryo prior to dorsal closure did not induce serosal rupture and global retraction, despite resulting in a small wound and a slight retraction of the tissue around the injection site. In addition, rupture still occurs in embryos injected with Rho-kinase (ROCK) inhibitor, which reduces actomyosin contractility. Lastly, rupture always initiates at a very specific ventral-posterior site. Taken together, these observations indicate that rupture is not triggered exclusively by global straining and non-autonomous forces applied to the serosa tissue. Instead, rupture seems to be triggered by a specific localized cue. Upon rupture, the remaining serosal tissue retracts and constricts dorsally through an actomyosin-dependent mechanism, in a way similar to serosa rupture and retraction in the beetle T. castaneum (Hilbrant et al., 2016; Panfilio et al., 2013). The retracting serosa then internalizes into the dorsal opening of M. abdita. Concomitant with serosal internalization, a JNK/Dpp-dependent actomyosin cable forms at the epidermal leading edge of M. abdita embryos. It promotes the advancement of the opposing epidermal flanks toward the dorsal midline, and the eventual seaming of the two flanks. This stage of dorsal closure occurs in a similar fashion to D. melanogaster, but differs in comparison with T. castaneum, where no actomyosin epidermal cable appears to be involved in epidermal flank advancement (Panfilio et al., 2013). In contrast to D. melanogaster, dorsal closure in M. abdita involves an additional amniotic seaming process. Our experimental data indicate that amniotic seaming is microtubule-dependent and essential for dorsal closure to occur. Thus, similar to epidermal seaming in D. melanogaster embryos, where microtubules align dorsoventrally prior to tissue fusion (Jankovics and Brunner, 2006), the two sequential amniotic and epidermal seaming processes in M. abdita also involve a dorsoventral alignment of microtubules. Why microtubules align in this way remains unclear. 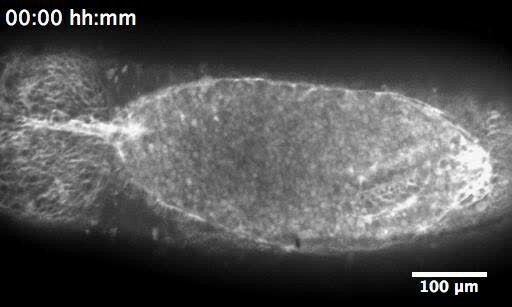 One possible scenario is that shape elongation of amniotic cells toward the retracting and internalizing serosa could promote microtubule reorientation in the direction of contractile cells. Interestingly, cellular fusion in the developing trachea of D. melanogaster involves cell elongation and microtubules orientation toward the site of fusion (Kato et al., 2016). Elongation of cells toward a contractile tissue also occurs during gastrulation in D. melanogaster (Rauzi et al., 2015) and neural tube closure in the chordate Ciona intestinalis (Hashimoto et al., 2015). It is not known whether microtubule alignment also occurs in the latter processes to promote epithelial fusion. If this is the case, the microtubule-dependent seaming that we describe might reflect a common mechanism for epithelial tissues to fuse. It remains unclear whether microtubule-dependent epithelial seaming is a process that can generate forces contributing to dorsal closure. In the case of D. melanogaster, laser-ablation of epidermal canthi (i.e. the epidermal corners where opposing epidermal flanks meet) slows down the last stages of dorsal closure (Wells et al., 2014). However, F-actin-enriched epidermal seaming still occurs between the opposing leading edges of the epidermis despite the removal of the canthi. Dorsal closure in embryos of M. abdita presents two sequential seaming events that share a common feature: transient microtubule reorganization. It would be interesting to explore if the cytoskeletal basis (i.e. microtubule reorganization) of epithelial seaming events is conserved in other insect species with a three-tissue system of dorsal closure, for example T. castaneum. Our work suggests that the evolutionary transition from a three-tissue to a two-tissue system of dorsal closure not only involves the reduction of extraembryonic tissue, for example from distinct amnion and serosa to a fused amnioserosa (see Horn et al., 2015; Rafiqi et al., 2008; Rafiqi et al., 2010; Schmidt-Ott and Kwan, 2016). In addition, it requires changes in epidermal progression and seaming events. Further development of imaging and molecular tools in M. abdita will help us better understand the subcellular, cellular, and tissue dynamics that led to this evolutionary transition. In the case of dipteran dorsal closure, it appears that the evolutionary modulation of tissue remodeling is mainly driven by morphological rearrangements rather than large changes in gene expression. This study provides the first detailed analysis of tissue anatomy and dynamics complemented with gene expression assays to understand the evolution of a morphogenetic process. In this respect, dipterans provide a powerful model to understand the interplay between tissue rearrangement and gene expression during the evolution of development. Our M. abdita fly culture was maintained as previously described (Rafiqi et al., 2011a). Embryos were collected at 25°C for 4 hr, and then incubated at 19°C until they reached stages 13–15, corresponding to dorsal closure as described in Wotton et al. (2014). Mab_bsk was cloned using sequence data from a published early embryonic transcriptome (http://diptex.crg.es; gene ID: Mab_bsk: MK10) (Jiménez-Guri et al., 2013). Briefly, open-reading frames (ORFs) were PCR-amplified based on cDNA from 0 to 5 hr-old M. abdita embryos. Amplified fragments were cloned into PCRII-TOPO (Invitrogen, Carlsbad, CA) or pGEM-T (Promega, Madison, WI) vectors using the following specific primers (5’/3’): Mab_bsk, TGCCCGTCATCAGTTTTACA and GACGACGCGGGACTACTTTA. dsRNA was performed using the Ambion MEGAscript kit (Life Technologies, Carlsbad, CA). The following specific primers (5’/3’) containing a T7 promoter sequence at their 5’ end were used: Mab_bsk, GGTGGGCGACACAAGATT and AAACAGGCATCGGGGAAT. RNAi injection was performed using previously published protocols (Rafiqi et al., 2008; Rafiqi et al., 2010; Rafiqi et al., 2011d; Wotton et al., 2015). Dechorionated embryos were injected prior to gastrulation at a concentration of 5 µM for Mab_bsk, then incubated at 25°C. The injected dsRNA construct comprised 798 nucleotides (base pairs 369–1166 of the ORF) for Mab_bsk. In situ hybridization in heat-fixed M. abdita embryos was performed according to a previously published protocol from D. melanogaster (Crombach et al., 2012). Digoxigenin-labeled Mab_dpp probe is from Jiménez-Guri et al. (2013). Fixation, devitellinization and immunostaining of M. abdita embryos were performed as previously described (Rafiqi et al., 2011c; Rafiqi et al., 2012) with slight modifications. Briefly, embryos undergoing dorsal closure were dechorionated and fixed for 25 min in heptane and PEMS (100 mM PIPES, 2 mM EGTA and 1 mM MgSO4, pH 6.9), in a 3:1 PEMS:methanol solution, and a final concentration of 6.5% formaldehyde. Embryos were postfixed and hand devitellinized as described (Rafiqi et al., 2012). Microtubules were stained using a monoclonal primary antibody (mouse) against β-tubulin (E7, Developmental Studies Hybridoma Bank) at a dilution 1:100, and a secondary antibody conjugated to Alexa 488 dye (Invitrogen, Carlsbad, CA) at a dilution of 1:1000. For phalloidin staining, embryos were fixed for 1 hr using PEMS and a final concentration of 8% formaldehyde, hand-devitellinized as described for D. melanogaster embryos (Fernández et al., 2007; Kaltschmidt et al., 2002; Rothwell and Sullivan, 2000), and incubated with phallodin-Alexa488 or phalloidin-Alexa563 (Invitrogen, Carlsbad, CA) at a dilution of 1:200 for 1 hr. When double-staining against phalloidin and microtubules, embryos were fixed, hand-devitellinized, and stained for phalloidin first, followed by incubation with the β-tubulin primary and secondary antibodies as above. Nuclei were counterstained using DAPI (1:1000). Embryos were washed in PBT (PBS, with 0.1% Triton X-100), and mounted using ProLong Gold Antifade (Invitrogen, Carlsbad, CA). Cuticle preparations of M. abdita embryos were performed as previously described (Rafiqi et al., 2011b) with slight modifications. Briefly, embryos were fixed and hand-devitellinized before preparing and mounting the cuticles. Images of cuticle preparations were taken using a phase-contrast microscope. Time-lapse imaging was performed with dechorionated M. abdita embryos. RNAi-injected embryos were imaged using a Zeiss Cell Observer with a controlled temperature chamber at 25°C and phase contrast settings. 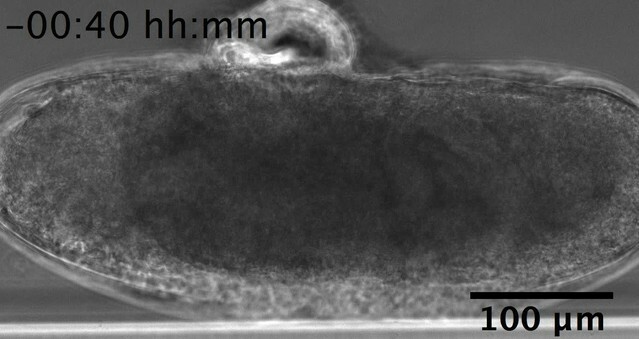 For fluorescence imaging, wild type embryos at dorsal closure stage were desiccated for 5 min, aligned, oriented, and immobilized on a coverslip with heptane glue, covered with halocarbon oil and injected at the embryo poles with 1 mM (needle concentration) of the lipophilic dye FM 4–64 (Molecular Probes). Embryos were imaged at room temperature using an Andor Revolution XD spinning-disk confocal microscope. ROCK inhibitor Y-27632 (Sigma-Aldrich, St. Louis, MO) and colcemid (Santa Cruz Biotechnology, Santa Cruz, CA) were prepared to 10 mM and 500 µg/ml (needle concentration), and also injected at the embryo poles during dorsal closure stage. Control embryos were injected with water or DMSO, respectively. Final needle concentrations of dye and/or drugs were prepared in injection buffer (10 mM HEPES, 180 mM NaCl, 5 mM KCl and 1 mM MgCl2, pH 7.2), and delivered to the interstitial space formed between the serosa and the embryo. Confocal projections of ~10 z-stack images (1 µm spacing) were used to generate time-lapse sequences in dorsal view. Orthogonal views from time-lapse live imaging were obtained by reslicing confocal z-stacks of 0.25 µm spacing. The height (h) of the dorsal opening is the maximum perpendicular distance from the dorsal midline to the epidermal leading edge (Hutson et al., 2003). The changes in area of the serosa covering the embryo over time were determined by approximating the embryonic shape using an ellipse and resizing manually to follow the serosa edge on one lateral side during retraction, assuming that serosa retraction occurs symmetrically on both sides of the embryo after rupture along the ventral midline. Detection of serosal edge morphology from bright-field time-lapse sequences was performed by subtracting images at time t + 1 from images at time t. This operation rendered the contour of the retracting serosa visible. The identification of extraembryonic tissues was performed using nuclear anatomy, staining profiles and z position of the nuclei in confocal stack images obtained from fixed embryos labeled with DAPI. Staining profiles, nuclear areas and z position in the embryo were measured in 150 cells for each cell type (serosa and amnion) from 15 different embryos. 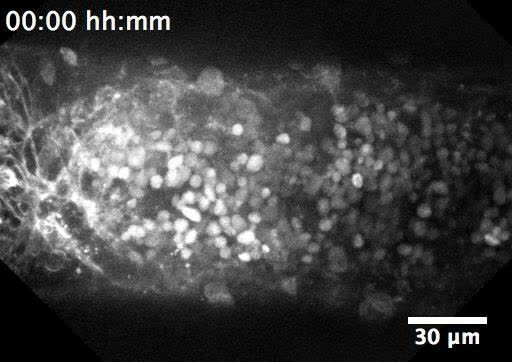 UV irradiation experiments to deactivate colcemid were performed as follows: dechorionated, desiccated, FM 4–64-labeled and colcemid-injected M. abdita embryos were immobilized in heptane glue, mounted in halocarbon oil, and imaged dorsally in an inverted Leica TCS SP5 laser-scanning confocal microscope in resonant scanner mode. Colcemid injection was performed during dorsal ridge fusion and prior to serosa rupture. Imaging acquisition started ~30 min after injection. A region of interest (ROI) was selected comprising an area between the epidermal flanks and the internalizing serosa, corresponding to the extraembryonic amnion. The ROI was scanned for at least 30 s using a 405 nm UV laser and imaging was resumed after irradiation. Fixed, immunostained embryos were imaged as follows: images were acquired using an inverted Leica TCS SP5 laser-scanning confocal microscope. All post-acquisition image processing and analysis was done using ImageJ software (NIH). For Voronoi analysis, the center of mass of cell nuclei was detected manually with Fiji and used as seed for Voronoi tessellation with Matlab. The Journal of Cell Biology 208:239–248. The Journal of Cell Biology 149:471–490. Cold Spring Harbor Protocols 2011:pdb.prot5600. Cold Spring Harbor Protocols 2011:pdb.prot5603. Cold Spring Harbor Protocols 2011:pdb.prot5602. Cold Spring Harbor Protocols 2011:pdb.prot5601. 141–157, Fluorescent analysis of Drosophila embryos, Drosophila Protocols. Roux's Archives of Developmental Biology 203:298–303. Molecular Biology of the Cell 25:3552–3568. Thank you for submitting your article "Two consecutive microtubule-based epithelial seaming events mediate dorsal closure in the scuttle fly Megaselia abdita" for consideration by eLife. Your article has been evaluated by K VijayRaghavan (Senior Editor) and three reviewers, one of whom is a member of our Board of Reviewing Editors. The reviewers have opted to remain anonymous. Three reviews have now been obtained for the manuscript "Two consecutive microtubule-based epithelial seaming events mediate dorsal closure in the scuttle fly Megaselia abdita". As you will see from their individual comments, all three reviewers agree that the manuscript addresses an interesting question. However, all have substantial concerns about the conclusions of the manuscript and suggest ways in which the conclusions must be strengthened. Their suggestions are summarized below. i) The authors must provide better data to support their claims on tissue topology (serosal ingression, serosa amnion connection), novel cell behaviours (two seaming/fusion events, cell behaviours accompanying ingression) cytoskeletal organisation (actin enrichment at two edges and microtubule reorganisation in the amnion and epidermis) and gene expression patterns. Cross sectional views that support the schematic drawings provided in Figure 1G will be valuable. The temporal evolution of cell biological and cytoskeletal changes must also be better documented even if this comes from fixed rather than live embryos. ii) The mechanistic claims made are too strong and not backed by the present set of experiments which lack tissue specificity. They must be toned down or backed up by more local perturbations as for example by caged compounds or laser ablation. iii) The Discussion must be improved to better illustrate the importance of the work and must make references to relevant work in Drosophila, Tribolium and Megaselia. 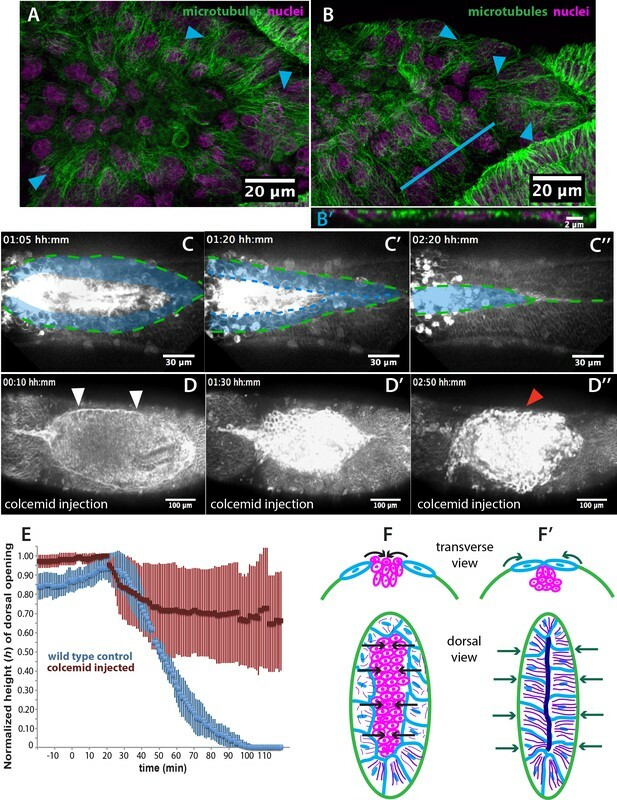 In this manuscript, Solon and colleagues examine the conservation of signaling and cytoskeletal mechanisms accompanying dorsal closure, a model for epithelial fusion, in the scuttlefly, a cycloraphan, non-Drosophilid dipteran insect, in which the process requires three tissues (including the epidermis and separate amnion and serosa) rather than two (including the epidermis and amnioserosa). The issue being addressed is whether the separation of the amnion and serosa, a common feature of many insects, results in closure that is mechanistically or molecularly different from closure in insects like Drososphila in which they are combined into one. Using a combination of gene expression analysis, cell biology and live imaging, the authors i) document differences (with Drosophila) in the tissue dynamics accompanying dorsal closure (which they show includes serosal rupture, retraction and ingression), ii) identify cytoskeletal changes that accompany it (including two sites/edges of actin enrichment and two sites of microtubule orientation rather than one), iii) suggest the involvement of actomyosin based contractility in the serosa and epidermis and microtubule orientation in the formation of the epidermal and amniotic seams and iv) provide evidence for the conservation of JNK signalling in the epidermis. They also suggest that both the amnion and the epidermis contribute to seam formation and closure. Dorsal closure in Drosophila has served as a good model to address the conservation of mechanisms underlying epithelial fusion across tissues and organisms. It has also been the focus of studies in evo-devo, particularly with respect to the origin of insect extraembryonic membranes and their indispensable contribution to embryonic patterning. How the two separated extraembryonic membranes interact physically and functionally during dorsal closure has also been the subject of an interesting recent paper on dorsal closure in the flour beetle, Tribolium published in eLife (Hilbrant et al., eLife2016). In this context, I think the manuscript presents some new and interesting findings in an emerging model organism, in particular, the quantitative analysis of tissue dynamics, a suggestion of their force contributions, and involvement of the microtubule cytoskeleton in the formation of two seams rather than one. While the manuscript uses genetic perturbations and chemical treatments, the lack of tissue targeting of these perturbations makes some of the mechanistic statements too strong. While I appreciate both the excitement and the limitations that working with an emerging model can have, I believe that some of the conclusions must be strengthened before the manuscript can become suitable for publication. I list my major concerns and offer suggestions below. 1) While the images show the D-V alignment of microtubules in the epidermis and amnion, the requirement of oriented microtubule organization specifically in the amnion and the epidermis (rather than just an intact microtubule cytoskeleton everywhere) is not borne out from the drug treatments. “In contrast, dorsal closure arrests during serosa ingression (red arrowhead in Figure 4D') due to depolymerized microtubules in both the amnion and the epidermis (blue and white arrowheads, respectively in Figure 4—figure – supplement 3C) impairing epithelial seaming and aborting dorsal closure (red curve in figure 4E)”. Does colcemid treatment also affect the microtubule network in the serosa? Does colcemid affect serosal ingression? Can the authors attempt to locally perturb the microtubule cytoskeleton using caged compounds? 2) The causal relationship between serosal ingression and the fusion of the amnion is not clear. Is the former a prerequisite for the latter? Does the serosa induce microtubule organization in the amnion, through its contractility? Does the ROCK inhibitor affect it? (see “opposing amniotic seams fuse at the midline upon serosa ingression” and “a functional serosa induces proper microtubule alignment”; Figure 4—figure supplement 2B')? Also does serosal ingression drive amnion cell elongation? Can the authors laser ablate the serosa during ingression to validate this? 3) Is serosal ingression mediated by apical constriction: does the apical area of serosal cells reduce with time? 4) Is amniotic fusion a prerequisite for epidermal fusion? (see “both processes are necessary for completion of epidermal seaming and dorsal closure”). Again, can the authors ablate the amniotic fusing front and look at the effects on the epidermal seam? 5) The accumulation of F-actin at the point of fusion of the amniotic flanks needs to be better illustrated. Can the authors use the FM dye with phalloidin so that the cell membranes are also labeled? 6) The work will benefit from better discussion and comparisons with work in Drosophila and Tribolium and other Megaselia work on dorsal closure. From the presented data it is not really clear how this connection works so that it can generate a physical obstruction. In Figure 1B the amnion cells appear rather loosely apposed to the serosa prior to rupture. After rupture and during dorsal closure (Figure 1G) the serosa definitely has to be connected (or reconnected) to the serosa. The scheme appears to suggest substantial changes regarding the interactions between serosa and amnion during rupture and dorsal closure. Most of the presented data support dissimilarity: the morphology looks different; there is no very sharp boundary between amnion and serosa. Indeed, in most figures the border is rather hard to see. There is no clear actomyosin cable, no dpp expression. What you call "seaming" could just be the trace of high level of F-actin left behind by the last serosa cells that are ingressing. Figure 1: What does interspersed nuclear architecture mean? The false coloring in Figure 1—figure supplement 1 rather relies on the position of the nuclei, at least as far as I can judge form the presented micrographs. Figure 1—figure supplement 1. The ISHs have very low quality. B (early Mab_zen) could be an over-stained embryo. Amnion-specific expression of Mab_pnr in C is not clearly visible. In Drosophila (and Tribolium) pnr also marks the dorsal epidermis. This could be the same in Megaselia. Figure 1A´: A cross section with membrane markers should be added which shows the cellular arrangements of dorsal ectoderm, amnion and serosa giving rise to the scheme B. Figure 1C: What is the identity of the large elongated cells at the dorsal center? Figure 2B: This is a very bad high contrast micrograph taken with completely different microscope setting than the wt control. Figure 2C: The morphological basis for the yellow lines is not visible in the micrographs. Figure 4F and F´: Transvers optical sections of the embryo shown in 4C should be provided to support schematic sections shown in 4F and F´. How much cell death is occurring during these stages? This can be tested with a number of simple AB stainings. 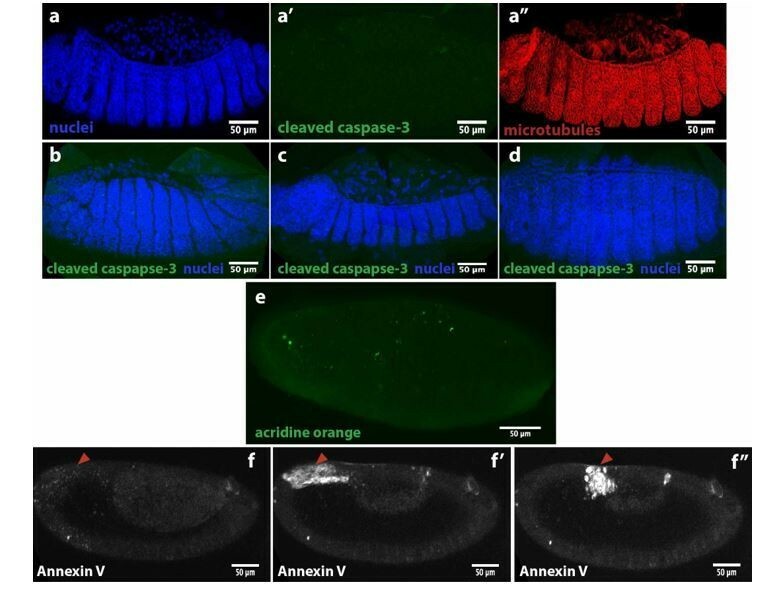 The manuscript by Fraire-Zamora and colleagues investigates the process of dorsal closure in the scuttle fly an insect with a separate amnion and serosa tissues (as opposed to Drosophila, which has single amnioserosa tissue). They find that the signaling and some of the morphogenetic processes are similar to Drosophila and suggest that the evolution of this process involved changes in tissue number, rather than changes in signaling. 1) I think the manuscript can improve the explanation as to why this finding is interesting. The authors say the "evolution of morphogenesis is generally associated with changes in genetic regulation", but they do not cite evidence for this and so there is little context to assess their claim. 2) There are contradictions to past work, one being a recent paper from the authors of this study (Saias et al., 2015). The authors state, "a JNK/Dpp-dependent contractile epidermal cable and the contraction of the amnioserosa tissue power the progression of dorsal closure, where the actomyosin cytoskeleton is essential in force generation". In Saias et al. (2015), they argued that myosin antagonized closure, this is confusing. 3) While the "seaming" is interesting, dorsal closure can occur without the seams. See Wells et al., 2014. The authors need to cite this paper and rationalize why they focus on the "seaming" process, which does not seem to be the major force generator. Thank you for resubmitting your work entitled "Two consecutive microtubule-based epithelial seaming events mediate dorsal closure in the scuttle fly Megaselia abdita" for consideration by eLife. Your article has been evaluated by a Senior Editor and three peer reviewers, one of whom is a member of our Board of Reviewing Editors. The reviewers have opted to remain anonymous. The revised version of the manuscript by Solon and colleagues was reviewed by two of the reviewers of the original manuscript and a third new reviewer. As you will see from their individual comments below, all reviewers agree that the question that the paper addresses is very interesting. The two original reviewers also appreciate the effort that the authors have made to address some of the queries raised by the reviewers in the previous version (including orthogonal views, additional images and analysis to better define tissue topology and new laser ablation experiments to test the requirement for the cellular behaviours such as serosal ingression and the two seaming events in the process). All three reviewers however feel that the description of the process and the cellular and subcellular mechanisms invoked as being important are not sufficiently strongly backed up by the data presented whose quality is also variable. The new experiments are also not conclusive in their present form and are not critically evaluated by the authors. In addition, the new reviewer makes several very important points about the methodologies used and suggests alternative interpretations of the data presented (the zen RNAi experiments used to establish the critical requirement of the serosa, the "fast" dynamics of the amnion during "seaming" and the non-specific/global effects of microtubule inhibitors). Collectively, all three reviewers suggest that in addition to toning down the strength of the statements that imply mechanism, the authors must work on generating high quality data to strengthen the claims made about the cell biology of the process, taking into account several useful points made by the reviewers, for future submissions. In their revised manuscript, Solon and colleagues have attempted to address some of the queries raised by the reviewers in the previous version. Notably, they present some orthogonal views and additional images and analysis to better define tissue topology and perform new laser ablation experiments to test the requirement for the cellular behaviours (serosal ingression and the two seaming events) in the process. I appreciate the challenges and excitement of studying a new model organism, and that it is not trivial to obtain mechanistic cellular and molecular insights. I also appreciate the effort the authors have made to address the questions raised. I still feel that the description of the process and the cellular and subcellular mechanisms invoked as being important are not sufficiently strongly backed up by the data presented. Without a clear description of the topology of the process (even from fixed preparations with good orthogonal views), it is hard to interpret the consequences of the drugs used to perturb actomyosin contractility and the microtubule network, both of which appear to have widespread effects (including the patterning of and shape changes in the epidermis). Also, it is not possible to conclude much from the laser ablation experiments as presented here, which are very qualitative, other than that in some instances, it produced recoil and the process failed. I therefore feel that the statements made in the paper that relate to i) physical interactions between the participating tissues, ii) requirement of actomyosin contractility and iii) the two microtubule rearrangements for specific cell behaviours during dorsal closure are still too strong. I think the quantitative description of the tissue dynamics presented here (serosal area and height dynamics), if combined with a good cell biological description of the tissue topologies, interactions and cell behaviours and cytoskeletal organization, will in itself constitute an important piece of work in a new model organism and getting better quality data to strengthen these aspects will add significantly to our understanding of the conservation of developmental mechanisms. 1) While it is clear from the videos that serosal rupture and contraction (reduction in area of the sheet) occur, it is still not clear to me what the authors mean by serosal ingression. Looking at the videos, it appears as if the serosa ruptures and retracts, collapses over the dorsal opening and then degenerates. While the schematics are useful, the data presented do not convincingly reveal the earlier close apposition of the serosa and the vitelline membrane, serosal ingression, or the subsequent reapposition of the serosa and vitelline membrane (as depicted in the schematics in Figure 1G). What would be very useful, as suggested earlier, is a staged series of images of confocal projections in a lateral view, and dorsal-up views with their orthogonal sections. Phalloidin and DAPI should reveal these topologies and, at least in Drosophila, some phalloidin can get in through the vitelline membrane. 2) The authors measure the areas of serosal cells at different stages during dorsal closure and show that the apical areas reduce over time. This addresses a query I had raised in the previous version. The authors also show that the area of the serosa rapidly reduces. It would be desirable to see in an orthogonal view, what happens to the apicobasal axis of this sheet during contraction and ingression. 3) The correlation between cell elongation and microtubule organization suggests that the latter follows the former and may be a consequence of shape change (subsection “A microtubule-based seaming of the extraembryonic amnion is required for dorsal closure in Megaselia abdita embryos”, first and fourth paragraphs). The colcemid experiments indicate that the microtubule cytoskeleton is necessary for the timely completion of closure but do not point specifically to a role for microtubule rearrangements in the seaming events described. 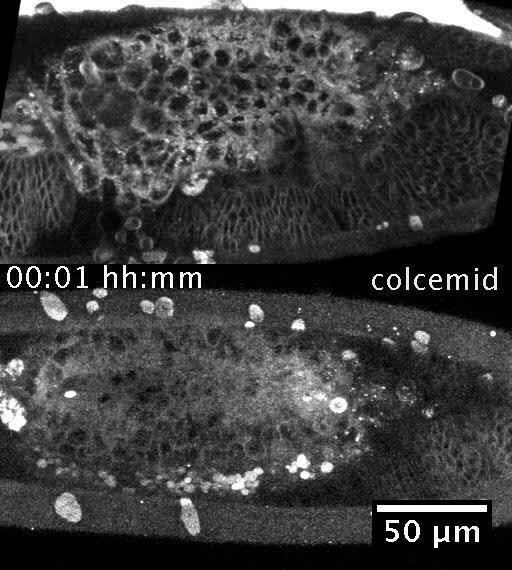 4) The effects of both the ROCK inhibitor (subsection “A microtubule-based seaming of the extraembryonic amnion is required for dorsal closure in Megaselia abdita embryos”, second paragraph, Video 5) and colcemid (Video 10) appear to be widespread. Specifically they do not help in resolving causality between cytoskeletal organization and cell behaviour. Both also appear to alter cell shapes/ pattern in much of the epidermis, which may also contribute to the effects on dorsal closure. 5) The statements made about attachment between the tissues (Figure 2E) are too strong and the schematics are not backed up by the data in the images. It is probably okay to say close apposition but active attachment is not reflected by the data shown (subsection “Dorsal closure in Megaselia abdita involves synchronized serosa rupture and epidermal progression”, third paragraph). 6) In the laser ablation experiments, the ROI ablated should be marked, the power regimes used and the number of embryos ablated for each experiment should be mentioned in methods. While some experiments show tissue recoil, the effect of ablation on the completion of dorsal closure is less clear. Overall, these experiments appear to be very qualitative. The authors have comprehensively responded to the reviewers’ concerns. They added new stainings and analyzed cross section to clarify the tissue topology. They also conducted new functional experiments; in particular, they performed laser ablations of serosa and amnion cells followed by live imaging. Most of the new material is convincing and supports the main conclusion of the paper that two subsequent epithelial fusion events are required for dorsal closure in Megaselia. I have however still a serious problem with variable quality of figures and videos. B, B´ I would remove this zen ISH. Both could be artefacts. This result is not important for the paper. D plus Video 1: it is not clear what one can learn from this video. I suggest removing. It is very laudable that the authors tried to do laser ablations of amnion and serosa cells. However, the video and stills from these ablations are very hard to interpret. The side of ablation and the cellular consequences are hardly visible. I am not able to interpret the pictures shown in Figure 4—figure supplement 3B-D and Video 8 does not help. The same applies for the amniotic ablations shown in Figure 4—figure supplement 5. Indeed, I found none of the laser ablation movies (Video 6–8) informative. It is also laudable that the author tried to produce optical cross section which in many cases helped to better understand tissue arrangements. However, the cross sections shown in Figure 4—figure supplement 6 seem not to be informative to me. Taken together the paper has clearly improved. But the authors unfortunately added material which does not really show what they want to say. I think most of this material can be just removed. The manuscript by Fraire-Zamora and coworkers deals with cell biological processes underlying dorsal closure in Megaselia abdita, a fly species that develops two distinct extraembryonic tissues, the amnion and serosa. The findings in Megaselia are placed into an evolutionary context by comparison with extraembryonic development and dorsal closure in Drosophila melanogaster, which develops only a single extraembryonic tissue, the amnioserosa. This comparison is aimed to gain insights into cell biological changes underlying the evolutionary transition in extraembryonic tissue development and topology. The question is very exciting as it aims to addresses how, in addition to changes in gene regulation and signaling, changes in epithelial organization and cell behavior contributed to the origin of evolutionary novelty. The authors describe dorsal closure in Megaselia as two subsequent events. They suggest that, first, the serosa is internalized and the amnion is seamed along the dorsal midline. Then, the amnion is internalized and the ectoderm is seamed along the dorsal midline. Both seaming events are described to be dependent on microtubule alignment, and microtubule alignment in the amnion (and, as a consequence, dorsal closure) is suggested to be dependent on a functional serosa. As a result, the two extraembryonic tissues may be seen as having the capacity to self-coordinate dorsal closure by a different cell biological mechanism than Drosophila despite conservation of late JNK/Dpp signaling. While I find the manuscript conceptually intriguing, I am not sure that all major conclusions are sufficiently supported by the presented data. In addition, I have some issues with methods and data quality. 1) The conclusion that the serosa is critical for alignment of the microtubule cytoskeleton is based on the analysis of genetic serosa depletion in zen RNAi embryos, the pharmacological inhibition of serosa cell activity by injecting ROCK inhibitor Y-27632, and by physical laser ablation of the internalizing serosa. Laser ablation and pharmacological inhibition of serosa cell activity leave behind tissue that can interfere with the behavior of the amnion. Thus the genetic depletion of the serosa in zen RNAi embryos represents a key experiment for the above conclusion. In the analysis of their zen RNAi results, the authors report early arrested embryos. Because this includes embryos dying for unspecific reasons (e.g. by the injection procedure per se), I would suggest to omit this data. The adjusted data shows that 2/3 of zen RNAi embryos develop a dorsal open phenotype and 1/3 of zen RNAi embryos show wildtype development. This is in line with previous results for Megaselia and Tribolium, which have shown that dorsal closure occurs in about 50%-75% of zen/zen1 RNAi embryos (Rafiqi et al., 2008; van der Zee et al. Current Biology 15, 624; Panfilio, Oberhofer and Roth, 2013). Discrepancies in the proportion of dorsally closed embryos in zen RNAi embryos reported here and in previous publications may stem from a method modification: because the authors fix the embryos prior to cuticle preparation, and because embryonic development is typically delayed after dsRNA treatment, it is possible that some embryos were fixed before cuticle formation was completed and thus were mistakenly classified as dorsal open. The authors show that in zen RNAi embryos microtubules are no longer aligned as in wildtype (Figure 4—figure – supplement 2B'), yet dorsal closure still occurs in 1/3 of zen RNAi embryos. The authors suggest that dorsal closure in zen RNAi embryos is due to incomplete gene knockdown, the development of a remnant serosa, and a local alignment of microtubules close to the remnant serosa. The key observation here is an accumulation of local F-actin, which the authors interpret as remnants of serosal tissue [subsection “A microtubule-based seaming of the extraembryonic amnion is required for dorsal closure in Megaselia abdita embryos”, third paragraph]. I do not think that local actin accumulation is sufficient evidence to interpret cells as remnants of serosal tissue, in particular since main conclusions of the paper depend on this result (1. microtubules need serosa to align, 2. aligned microtubules are required for dorsal closure). To support their interpretation convincingly, I would suggest the authors build on their defined tissue-specific features of the serosa [subsection “Dorsal closure in Megaselia abdita involves synchronized serosa rupture and epidermal progression”, first paragraph], and use them to demonstrate the presence of serosal remnants in zen RNAi embryos by marker gene expression (zen, ddc could be an alternative (Rafiqi et al., 2010)), nuclear size, and DNA compactness. 2) The conclusion that the amnion fuses by seaming along the dorsal midline is based on time lapse recordings after FM4-64 injection (Video 9). The video shows how the flanking cells of the amnion meet along the dorsal midline after the serosa is internalized. Following serosa internalization and amnion touching, the ectoderm meets along the dorsal midline. The two processes seem to follow very different dynamics. In case of amnion cell meeting along the dorsal midline, cells touch and close a gap over the serosa at a speed of about 6 µm/min (i.e. 30 µm at 1:10-1:15). In case of the ectoderm cell meeting along the dorsal midline, cells touch and close a gap over the amnion at a speed of about 1.2 µm/min (i.e. 30 µm at 1:50-2:15). While the dynamics in the slow fusion in the ectoderm appear consistent with the idea of seaming, I am concerned that the fast touching of the amnion cells is not an equivalent process. Rather than a seam of fused cells, the somewhat brighter cell boundary between touching amnion cells along the dorsal midline may just reflect the increased intensity due to the touching membranes of two amnion cells and/or remnants of actomyosin accumulation at the serosa/amnion interface. 3) The conclusion that microtubule organization in the amnion is required for epithelial seaming and dorsal closure is based on time-lapse recordings after injection of colcemid, which leads to what is described as "dorsal closure arrests during the initial stages of serosa ingression". I am not quite sure the Video shows an "arrest". When serosa internalization does not proceed further (02:10), dorsal closure seems to reverse rather than being arrested. I am worried that instead of showing a specific effect of microtubule depolymerization, this is due to a collapse of the system and dying of the embryo. Because this is a key experiment aimed to demonstrate a role of microtubules in dorsal closure, it would be necessary to address such concerns by providing more information (how often has this phenomenon been observed in independent experiments, what are possible explanations for the observed serosa eruption) and/or by a more local perturbation of microtubule organization in the amnion. 4) The conclusion that amnion seaming is a prerequisite for epidermal seaming is based on laser-ablation. Following laser ablation of what is described to be the amniotic-seaming front, epidermal seaming stops and results in a late dorsal open phenotype. It is difficult to follow the experiment based on the provided time-lapse recordings. In the wildtype reference (Video 9), ectoderm, amnion, and serosa cells can be clearly distinguished. In the time-lapse recording that is meant to show ablation of the amniotic-seaming front (Video 11), neither amnion nor serosa cell outlines are visible. Thus it is not possible to localize the laser ablation and what tissue has been affected. The visualization of the amnion, the area in which the amnion cells touch along the dorsal midline, and the ablation precisely where amnion cells touch, is, however, critical to demonstrate that dorsal closure is impaired due to interference with "amnion seaming" (see above for concerns about "seaming") and not just due to the loss of amnion tissue integrity. 1) The authors use nuclear size and DAPI density to characterize tissue type [subsection “Dorsal closure in Megaselia abdita involves synchronized serosa rupture and epidermal progression”, first paragraph]. How was area and density of DNA stain in Megaselia defined as faithful descriptors of cell type? In its current presentation, the coloration of nuclei appears a bit arbitrary, even though it is most likely based on a double staining of marker genes (zen for serosa, pnr for amnion) and DNA stain to correlate nuclear size and DNA density with tissue types. To explain their rationale better, the authors should add an image of a such double staining and illustrate how the quantitative and tissue-specific parameters of nuclear size and "DNA compactness" were obtained. 2) Classification of serosa and amnion in Figure 1—figure – supplement 1A is puzzling. The red nucleus on top of the third blue nucleus from the right seems to have a size that fits into the amnion category. What is the basis to classify this nucleus as serosal? Is it the density of the DNA stain? It does not become clear by which procedure two qualitatively different parameters (nuclear size and "DNA compactness") were compared if they contradict each other in the classification of a particular nucleus. Probably this is done by some sort of quantitative measure – the authors should comment on this procedure in more detail in the Materials and methods section. 3) The density of serosa cells in Figure 1—figure – supplement 1A – are unexpectedly variable, it seems to be much higher in areas where the serosa covers the ectoderm than in areas covering the interface of amnion and ectoderm, the amnion, or the yolk. In previous publications and other images within this publication (e.g. Figure 1A, Figure 1—figure – supplement 2A), the density of serosa nuclei appears to be rather even along the dorsal to ventral circumference of the embryo. Could the authors offer an explanation for this discrepancy? 4) Whole mount in situs of Mab_zen and Mab_pnr are not of high quality. In situs in Megaselia should be an established procedure, also for embryos at late stages (e.g. Rafiqi et al., 2010). In their description of gene expressions, the authors do not mention the staining of Mab_zen and Mab_pnr probe in the head and Mab_zen probe along the ventral midline. Do they have reasons not to trust this aspect of the staining? Dorsal staining of Mab_zen probe and Mab_pnr probe could be genuine, but this is difficult to evaluate at this quality level: poorly devitellinized embryos can lead to similar dorsal staining through unspecific probe accumulation at cracks in the vitelline membrane. 5) The authors suggest that devitellinization results in damage of the dorsal region of the embryo [subsection “Dorsal closure in Megaselia abdita involves synchronized serosa rupture and epidermal progression”, third paragraph], where they do not detect phalloidin staining (Figure 1—figure – supplement 2B). This suggest the authors have evidence that the amnion is normally closed at this point of development. This is contradicting the schematic overview in Figure 1B,B'. To clarify, it would be helpful to provide a brief description and maybe a panel with a closed amnion to illustrate the progression of wildtype amnion development. 6) What is the stage of dorsal closure in Figure 1—figure – supplement 2D-D'? In the schematic overview (Figure 1—figure – supplement 2E) it seems as if the serosa still envelopes most part of the embryo. The embryo shown in 2D-D' seems to be older and serosa internalization well under way, corresponding to the schematic overview in Figure 1G'. The authors explain that serosa tissue can be lost during devitellinization, suggesting that they used alternative landmarks to stage dorsal closure progression. It would be helpful if they could comment on their use of landmarks and how the embryo in 2D-D' was staged. 7) The authors suggest that amnion and serosa share a junction or attachment site [subsection “Dorsal closure in Megaselia abdita involves synchronized serosa rupture and epidermal progression”, third paragraph]. The increase of phalloidin staining in Figure 1—figure – supplement 2D' is sufficient evidence that the cell with blue arrow touches the cell with white arrow. A blob of actin does not provide evidence for junctions, and the black lines indicating amnion-serosa attachment in schematic in Figure 1—figure – supplement 2E may be interpreting the available data a bit too much. Thank you for resubmitting your work entitled "Two consecutive microtubule-based epithelial seaming events mediate dorsal closure in the scuttle fly Megaselia abdita" for further consideration at eLife. Your revised article has been favorably evaluated by K VijayRaghavan (Senior editor) and two reviewers, one of whom is a member of our Board of Reviewing Editors. Both reviewers agree that the revised version is a substantial improvement over the earlier versions both with respect to the conclusions and the readability. Specifically, the new data presented clarifies many issues on the topology of interacting tissues and the cell shape changes accompanying serosal contraction and provides a better resolution of the two seaming events. The reviewers were also impressed with the experiments designed to locally inactivate colcemid. Both reviewers had a few concerns that must be addressed (in a revision) and made the following suggestions. i) While the orthogonal sections presented do a good job of showing tissue topology, serosal ingression and its accompanying cell shape changes, the final configuration of the three tissues is not clear. It should be possible to resolve this by making orthogonal optical sections at different locations along the AP axis (at the canthus and closer to the AP midline) from the images presented in Figure 1—figure supplement 1C-C'", phalloidin DAPI and Figure 4—figure supplement 1C-C"', tubulin, DAPI, since closure proceeds inwards from the canthi. ii) The schematics depicting the changes in the three tissues participating in dorsal closure must be modified to accurately depict the serosal cell shape changes described and to indicate the final configurations of the three tissues at the end of the closure. iii) The data on the local colcemid inactivation includes two images and quantification of dorsal closure height. The authors must state when colcemid was injected and when it was inactivated and describe in Materials and methods how the ROI was created. It would be desirable to include the video of the treatment. iv) Could the authors comment on the fate of the amnion: What happens upon fusion: does it detach from the epidermis? Or does it ingress with the serosa? Again orthogonal optical sections from the fused regions should help resolve this. v) Can the authors clarify if they are suggesting that the "movement " of amnion cells (devoid of actomyosin) is microtubule dependent and whether serosal contraction contributes to bringing the amnion flanks into close proximity? […] 1) While the images show the D-V alignment of microtubules in the epidermis and amnion, the requirement of oriented microtubule organization specifically in the amnion and the epidermis (rather than just an intact microtubule cytoskeleton everywhere) is not borne out from the drug treatments. “In contrast, dorsal closure arrests during serosa ingression (red arrowhead in Figure 4D') due to depolymerized microtubules in both the amnion and the epidermis (blue and white arrowheads, respectively in Figure 4—figure supplement 3C) impairing epithelial seaming and aborting dorsal closure (red curve in figure 4E)”. Does colcemid treatment also affect the microtubule network in the serosa? Does colcemid affect serosal ingression? Can the authors attempt to locally perturb the microtubule cytoskeleton using caged compounds? The reviewer wonders about the interpretation of the colcemid experiments and whether contribution from defects in serosa retraction and ingression could also contribute to the observe phenotype. 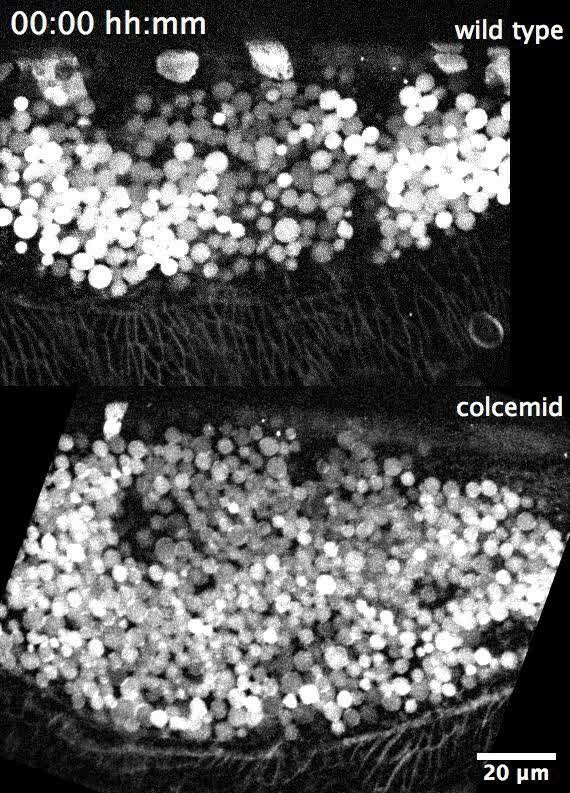 We have performed additional immunostaining of colcemid treated embryos that show that the microtubule network in the serosa is also altered. These images are now in Figure 4—figure supplement 4B and B’. In order to verify whether colcemid treatment would affect serosal retraction and ingression, we have quantified the kinetics of retraction in these embryos and it appears unchanged compared to wild-type. This quantification now appears in a revised Figure 4—figure supplement 4A of the manuscript. Serosa ingression in injected embryos does not progress, an expected outcome in the absence of seaming. For instance, in Drosophila, the last stages of amnioserosa contraction are also impaired with colcemid injection and the absence of epidermal seaming (Jankovics and Brunner 2006). Regarding the use of caged compounds, this would be a wonderful experiment to perform. However, this is challenging in a non-model organism where fluorescent labels are generally weak. Additional use of a UV laser may render the signal even weaker. Furthermore, to our knowledge, such compounds that perturb the microtubule cytoskeleton are not available commercially. To assess the influence of the serosa on microtubule organization and amnion cell elongation, we have performed immunostaining of microtubules and actin in contractility-impaired embryos (injected with Rock inhibitor Y27632). In these images, we did not observe preferential orientation of the microtubule network or elongation of the amnion cells towards the serosa. These figures are added in the new Figure 4—figure supplement 3A and A’. In addition to Y-27632 treatment, we have performed laser dissection experiments to ablate the serosa. These experiments are challenging because embryo labeling with FM 4-64 is not optimal to follow individual cell behavior in our laser dissection system. However, we managed to ablate the serosa and imaged ablated tissue in a different microscope with better resolution (see Materials and methods). We succeeded to observe that, upon serosa ablation, amnion cells adjacent to the ablated area do not elongate towards the dorsal midline (along the dorsoventral axis). Instead, amnion cell shape relaxes and follows the edge of the ablated serosa. Also, upon ablation and epidermal edge advancement, the shape of intact amnion cells changes progressively towards an anteroposterior elongation. This suggests that forces generated by the serosa contribute to amnion cell elongation along the dorsoventral axis. When these forces are not present, amnion cells fail to elongate dorsoventrally and instead elongate in an anterio-posterior fashion. The final result of serosa ablation is failure of dorsal closure as observed by a dorsal-open cuticle phenotype. The results of these laser-ablation experiments are now in the new Figure 4—figure supplement 3, Video 6 and Video 8. We have used laser dissection to ablate the amniotic seaming front and followed epidermal seaming after ablation (see Materials and methods). We observed that epidermal fusion progresses at sites where amnion cells remained intact, until the epidermal front reached the ablated amnion site. At this point, epidermal progression is arrested. Ablation of the amniotic seeming front resulted in incomplete epidermal closure and a small gap on the dorsal side (that we define as a late dorsal-open phenotype). These data indicate that amniotic fusion is a prerequisite for epidermal fusion. They are shown in the new Figure 4—figure supplement 5 and Videos 7 and 11. We have attempted to co-label membrane and phalloidin with FM 4-64 dye. However, we were not able to resolve membranes properly in fixed embryos (see Author response image 1). Instead, we have incorporated an image where the accumulation of actin along the site of amniotic fusion (white arrowhead in a and b) is clearer. By performing an orthogonal stack reslice (b), we observed that this accumulation is at the same z-plane as the epidermal actin cable (yellow arrowheads). Both images are included in Figure 3D and D’ (without the FM 4-64 label). The actin accumulation at the site of fusion also colocalizes with the FM 4-64 signal that we observe in fixed embryos, however, we do not incorporate this image since we think the resolution of membranes is not good enough for publication purposes. We have modified the text to include comparisons with Tribolium, Drosophila and previous Megaselia work on dorsal closure. We have performed additional staining both in live-intact embryos (DAPI injection) and in fixed devitellinized embryos. The resulting images provide better evidence on the anatomy of the three-tissue system and confirm the connection between the serosa, amnion and epidermis. These images are in the new Figure 1—figure supplement 2. We have modified the schemes in Figure 1B, B’ and 1G, G’ and G’’ to illustrate our observations in a more parsimonious way. We also added a scheme in Figure 1—figure supplement 2E of the physical obstruction that the serosa-amnion junction represents for the advancement of the epidermal front. It is difficult to assess whether F-actin accumulation at the merging site is exclusively left by the last ingressing serosa cell or exclusively from the amnion seaming process. The lack of UAS-GAL4 lines for M. abdita makes difficult to target specific tissues to obtain high-resolution data of whether Factin accumulation is exclusively amniotic. We have modified the text to describe nuclear staining rather than nuclear architecture. The false coloring is based on the area of the different nuclei, indicating different populations of cells. We have included the areas in the text, added a reference that used nuclear anatomy and staining to identify extraembryonic tissue in Tribolium (Panfilio et al., 2013) and stated that cellular identity is based on nuclear size, position and staining with DAPI and ISH markers (Mab_zen for serosa and Mab_pnr for amnion). We have substituted the Mab_zen image for a new one in which the ISH stains the nuclei in some ruptured serosa cells, revealing the underneath unstained epidermis. We would like to point out that obtaining a good ISH of the serosa covering the embryo is difficult because, during heat fixation and manipulation of the embryo, the serosa is mostly removed together with the vitelline envelope to which it adheres. Regarding amnion markers, in M. abdita, there is not a specific marker for the entire amnion (Rafiqi et al., 2010). Thus, different markers have been used to identify extraembryonic amniotic tissue. These M. abdita amnion markers are: C15, Krüppel (Kr), pannier (pnr) and hindsight (hnt). hnt seems to be more specific for amnion at late stages (despite being also expressed in the embryonic epidermis), as it has been observed in amniotic extraembryonic tissue during early germ band retraction (Rafiqi et al., 2008, 2010 and 2012). In our hands, ISH of Mab_hnt in embryos at dorsal closure stage does not stain extraembryonic tissue (see Author response image 2). Our Mab_hnt probe stains gut (a) and epidermis (b), as expected, but is not visible in the amnion (blue arrowhead in c). Since C15 also stains serosa and epidermal edge cells and Kr also stains developing serosa, we used pnr as an amnion marker despite it also marking embryonic epidermis. We have reproduced ISHs of pnr that show a faint staining in the amnion and parts of the epidermis (see red arrowheads in Author response image 3). As mentioned above to reviewer 1, plasma membrane imaging in fixed embryo is challenging, even more for non-devitellinized intact embryos that will preserve the original three-tissue system anatomy. FM 4-64 dye in fixed embryos does not provide a clear staining. We injected different membrane dyes (BODIPY, Dil, DiO and FM 4-64), but only FM 4-64 diffuses along the whole embryo surface. Alternatively, we tried to generate cryosections of M. abdita embryos stained with DAPI and methylene blue and embedded in OCT compound (see Author response image 4, dorsal is to the top and ventral to the bottom) as described in Panfilio et al., 2006 for Oncopeltus fasciatus. We were able to visualize serosa cells attached to the vitelline envelope and close to the dorsal part of the embryo (white arrowhead in b), however, the resolution of such sections is not good enough to be conclusive. On the other hand, we hand-devitellinized fixed embryos and immunostained for phalloidin and DAPI. In most of the cases, devitellinization also removed the serosa cells that are attached to the vitelline membrane in embryos at dorsal closure stage, and left ruptured amnion and intact epidermis in the embryo. In a couple of embryos, the serosa remained intact on top of the amnion and epidermal cells. An orthogonal stack reslice of the intact serosa on top of amnion and epidermis reveals the anatomy of the M. abdita three-tissue system, the relative position of serosa, amnion and epidermis and the shared junction by the serosa and amnion cells. These images are added in the new Figure 1—figure supplement 2. The identity of these cells with large elongated nuclei is unclear to us. They appear to be embedded in the yolk. They can be visualized clearly in Figure 1—figure supplement 2 and in Video 1. We have described them in the text as unidentified cells. In Drosophila, similar cells are also located within the yolk sac; these cells embedded in the yolk are thought to be haemocytes or crystal cells, however, we have no means to pin down the identity of the large cells with elongated nuclei in the yolk of M. abdita. We have described them in the text of the manuscript. We have substituted the images by two micrographs taken using the same microscope and camera settings. We have included the image processing method that allowed us to draw the contour of the serosa during retraction in bright-field image sequences. Due to low contrast in these images, we subtracted an image at time t+1from the image at time t. This simple operation allowed to highlight morphological changes between frames and to detect the reduction in serosa contour. This is included in Figure 2—figure supplement 1A and described in Materials and methods. Figure 4F and F´: Transvers optical sections of the embryo shown in 4C should be provided to support schematic sections shown in 4F and F´. We have now added transverse section (obtained by orthogonal stack reslicing) corresponding to Figure 4C in the Figure 4—figure supplement 6A-a’’. In these optical transverse sections we can identify the invagination and ingression of the serosa cells as depicted in the schematics on the Figure 4F. How much cell death is occurring during these stages? This can be tested with a number of simple AB stainings. We have used some markers for apoptosis to probe for cell death around dorsal closure stage. First, we used an antibody against cleaved caspase-3 that did not show any signal during serosa ingression in M. abdita embryos (see Author response image 5a’) compared to DAPI and microtubule immunostaining in the same embryo (a and a’’). The same antibody did not show signal during germband retraction (b), early dorsal closure (c) or after epidermal seaming (d). We also stained live M. abdita embryos with acridine orange, a dye used to evidence acidification during cell death, and did not observe a strong signal (e), except for some puncta that could be yolk granules or heamocytes. Injection of Annexin V, an early marker of apoptosis, showed a punctuated signal in the serosa (red arrowhead in f) that increased as the serosa retracted (f’) and at the time of ingression (f’’). Annexin V is a Ca2+-dependent protein that binds to phosphatidylserine (PS) when this phospholipid is externalized and exposed at the cell surface during early steps of apoptosis. Since Annexin V is not able to penetrate the lipid bilayer, it will only stain cells that are undergoing apoptosis, however, cells that are undergoing plasma membrane damage will allow Annexin V to enter the cell and stain PS in the inner leaflet of the bilayer (Bundscherer et al., 2014). Since serosa cells are also undergoing plasma membrane rupture, we cannot establish whether Annexin V is staining PS from the inner leaflet in damaged cells or externalized PS from early apoptotic events. Thus, we do not have conclusive evidence for cell death during dorsal closure in M. abdita embryos. We believe that, even if apoptosis may play an important role during the process, it is beyond the scope of the manuscript. […] 1) I think the manuscript can improve the explanation as to why this finding is interesting. The authors say the "evolution of morphogenesis is generally associated with changes in genetic regulation", but they do not cite evidence for this and so there is little context to assess their claim. There are no such contradictions. In Drosophila, actomyosin contractility is an essential force for closure progression. When amnioserosa cell contractility is suppressed, dorsal closure does not occur (see Scuderi and Letsou 2005, and Caussinus et al. 2012). In Saias et al. 2015, we show that, in addition of the contractility of the AS cells, a force emanates from the decrease in volume of the amnioserosa cells triggered by apoptosis. In Saias et al., we indeed have shown that down-regulation of myosin accelerates the first stages of closure, consistently with our 3D model of the amnioserosa cells where lateral tension would antagonize closure. However, we also clearly stated that myosin contractility is an essential force for closure and that in late dorsal closure stages in Drosophila, myosin enrichment is observed at the apical site of the cells. Whether epidermal seaming generates forces contributing to dorsal closure is still unclear and an open question. However, a slowing down of closure is observed by Wells et al., 2014 towards the end of dorsal closure in canthi ablated embryos, suggesting that seaming is likely to generate forces contributing to closure. […] Collectively, all three reviewers suggest that in addition to toning down the strength of the statements that imply mechanism, the authors must work on generating high quality data to strengthen the claims made about the cell biology of the process, taking into account several useful points made by the reviewers, for future submissions. The reviewer is concerned about the topology and positioning of the serosa tissue over time and, particularly, its relation with the vitelline envelope. We agree with the reviewer that the serosa tissue ruptures, retracts and a part of serosal tissue accumulates over the dorsal opening and will degenerate. However, we observe that, concurrently, a part of serosal tissue bends towards the yolk granules with an apicobasal elongation and is internalized into the embryo. To improve the clarity of the manuscript, we replaced the word “ingression” by the word “internalization” to describe the inwards bending of the serosa and eventual seaming of the epidermis on top. We now provide in the Figure 1—figure supplement 3 and Figure 4—figure supplement 2 additional confocal imaging of live embryos injected with FM-4 64 showing these changes in topology and morphology of the serosa during retraction and internalization of this tissue and have modified the text of the manuscript to better describe this process. As the reviewer also points, the schematics in Figure 1G were misleading, particularly on the potential relation between the serosa and the vitelline envelope. We have modified the schematics to clarify this point and would like to point out that our work aims to describe the sequence of morphogenetic events occurring during dorsal closure in Megaselia abdita embryos rather than the precise anatomical relationship between the serosa and the vitelline envelope. As proposed by the reviewer, we have added some orthogonal views of phalloidin-stained embryos showing an apico-basal reduction of the serosa cells during their retraction and internalization. This reduction correlates with an apical accumulation of F-actin. This is now represented in Figure 3—figure supplement 1 and is supported by the time-lapse sequence in FM4-64-labeled embryos in Figure 1—figure supplement 3 and Video 2 where an apico-basal elongation of the serosa cells is also observed during the retraction. Our experiments indicate that the microtubule cytoskeleton is necessary for the completion of dorsal closure and that the microtubules are aligned in both epidermis and amniotic tissue. This microtubule alignment correlates with cell elongation. We agree with the reviewer that our results do not point specifically to a role for this rearrangement in the seaming events. However, we show that similarly to Drosophila dorsal closure, microtubules in Megaselia embryos also align in tissues undergoing seaming (in this case amnion and epidermis) and are necessary for seaming, pointing towards a general mechanism for epithelial fusion. We have rephrased our results in the manuscript to tone correctly this message and to avoid overstatements. The reviewer is concerned about the effect of our pharmacological treatment on the different tissues involved in dorsal closure. This is a difficult point to address due to the lack of genetic tools in this non-model organism that could allow targeting specific tissues. To overcome this, we have performed additional live imaging that focuses on cell shape changes in the serosa upon drug treatment. These additional experiments show that Rhok inhibition blocks the serosal shape changes (i.e.apico-basal elongation and size reduction) and serosa bending and internalization. In the case of colcemid treatment, serosal shape changes and tissue bending are not affected, only complete internalization of the serosa is perturbed, consistent with microtubule being essential for amnion seaming but not for serosal retraction and remodelling. In addition, we show that amnion cells in wild type and colcemid-treated embryos have a similar elongation during serosa retraction and dorsal accumulation. These data are now in Figure 3—figure supplement 2, Figure 4—figure supplement 2 and the new Figure 4—figure supplement 4, respectively. 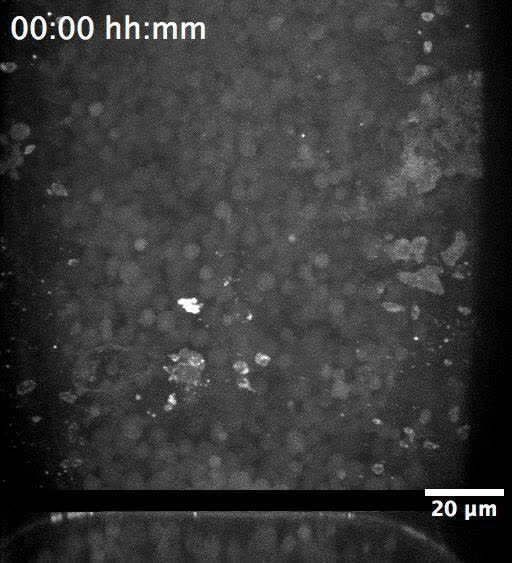 Finally, we have performed colcemid deactivation experiments by irradiating UV light in an area covered by the amnion cells prior to seaming in colcemid-injected embryos. These experiments are directed to reactivate microtubule polymerization, specifically in the amnion, and resume amnion seaming. Indeed, we observe a partial rescue of the process and progression of dorsal closure indicated by the reduction of the height (h) of the dorsal opening (see Figure 4—figure supplement 3). We believe these experiments indicate a role of the microtubule cytoskeleton in the seaming of the amnion during dorsal closure in M. abdita. We agree with the reviewer and have changed the wording of the manuscript to replace attachment by close apposition as the reviewer suggests. These experiments are challenging due to the low signal to noise ratio of the FM4 64 labeling and to potential contribution to the kinetics of a wound healing response. We have removed these experiments and, in complement, we have performed UV deactivation of colcemid. We believe colcemid-deactivation experiments are more informative on the requirement of microtubules in the amnion. We agree and have followed the reviewer’s suggestion. These data have been removed from the manuscript. As mentioned to the reviewer 1, the laser dissection experiments are very challenging on this non-model organism. We have replaced these experiments by UV deactivation of colcemid in an area covering the amnion during serosa internalization in colcemid-injected embryos. These experiments are directed to reactivate microtubule polymerization in the amnion and resume dorsal closure progression. Indeed, we observe a partial rescue of the process indicated by the reduction of the height (h) of the dorsal opening (see Figure 4—figure supplement 3). We find these experiments more informative on the impact of microtubule depletion in the amnion and the requirement of microtubules for dorsal closure progression. We have improved our live imaging acquisition parameters to obtain orthogonal views (cross sections) of embryos at the late stages of dorsal closure (during serosa internalization). These videos and still images of orthogonal views are included in Figure 1—figure supplement 3, Figure 3—figure supplement 2 and Figure 4—figure supplement 2. These images show the apico-basal elongation and internalization of serosa cells and the effects of the different drugs on these cell shape changes. We have followed the reviewer’s suggestions and, in one hand, removed low quality data from the manuscript, on the other hand, we have improved the data quality in other sections of the manuscript. We believe the new added data, particularly the cross sections kinetics in the different drug treatment, are of better quality and have significantly strengthened our previous observations. […] While I find the manuscript conceptually intriguing, I am not sure that all major conclusions are sufficiently supported by the presented data. In addition, I have some issues with methods and data quality. 1) […] The authors show that in zen RNAi embryos microtubules are no longer aligned as in wildtype (Figure 4—figure supplement 2B'), yet dorsal closure still occurs in 1/3 of zen RNAi embryos. The authors suggest that dorsal closure in zen RNAi embryos is due to incomplete gene knockdown, the development of a remnant serosa, and a local alignment of microtubules close to the remnant serosa. The key observation here is an accumulation of local F-actin, which the authors interpret as remnants of serosal tissue [subsection “A microtubule-based seaming of the extraembryonic amnion is required for dorsal closure in Megaselia abdita embryos”, third paragraph]. I do not think that local actin accumulation is sufficient evidence to interpret cells as remnants of serosal tissue, in particular since main conclusions of the paper depend on this result (1. microtubules need serosa to align, 2. aligned microtubules are required for dorsal closure). To support their interpretation convincingly, I would suggest the authors build on their defined tissue-specific features of the serosa [subsection “Dorsal closure in Megaselia abdita involves synchronized serosa rupture and epidermal progression”, first paragraph], and use them to demonstrate the presence of serosal remnants in zen RNAi embryos by marker gene expression (zen, ddc could be an alternative (Rafiqi et al., 2010)), nuclear size, and DNA compactness. The reviewer questions the implication of the serosa in the observed alignment of microtubules in the amnion. We would like to state that this is not a conclusion of the manuscript. This misunderstanding might have arisen due to our interpretation of the zen-RNAi results, thus, we would like to apologize for this. 1) Dorsal closure in M. abdita (a three rather than two tissue system) involves the rupture and contractility of serosal tissue, 2) the roles of the JNK/Dpp signaling pathway and an actomyosin epidermal cable during dorsal closure are conserved in M. abdita compared to D. melanogaster, and 3) morphologic and kinetic analysis of dorsal closure reveals two consecutive epithelial seaming process (amniotic as well as epidermal) that depend on the microtubule cytoskeleton. In the revised manuscript, we have removed the results of the zen-RNAi and laser ablation of the serosa since they are low quality data and can lead to misinterpretation. Instead, we have performed a rescue experiment on colcemid-injected embryos by deactivating the drug using UV irradiation in an area of the embryo corresponding to the amnion. As explained to reviewers #1 and #2, these experiments are directed to reactivate microtubule polymerization in the amnion and resume dorsal closure progression. Indeed, we observe a partial rescue of the process indicated by the reduction of the height (h) of the dorsal opening (see Figure 4—figure supplement 3). Our conclusion from these rescue experiments is that a polymerized microtubule cytoskeleton in the amnion is required for the progression of dorsal closure in M. abdita embryos. The reviewer is concerned about the differences in velocities in amniotic seaming and epidermal seaming, therefore questioning the potential similarities between the two processes. Seaming velocities are dependent on different factors such as the mechanical properties of the adhering tissues, their seaming angle or the contraction of the tissue covering the gap. In Drosophila, changes (up to a factor 2 in velocities) in epidermal seaming are observed during dorsal closure (Peralta et al., Biophys J, 2007). An estimation of amnion and epidermis seaming velocities in M. abdita embryos (8.1 ± 2 µm/min, SD, n= 5 embryos for the amnion and 3.8 ± 1.7 µm/min, SD, n= 5 embryos for the epidermis) indicate a variation of about a factor 2, which could also be due to differences in mechanics between amnion and epidermis. In the revised manuscript, we have included the estimation of the seaming speeds in the amnion and epidermis and discussed the differences in velocities between the two processes. These estimates can be found in the second paragraph of the subsection “A microtubule-based seaming of the extraembryonic amnion is required for dorsal closure in Megaselia abdita embryos”. The reviewer is concerned about the reproducibility and specificity of the phenotype observed with the microtubule depolymerizing drug colcemid. We point out that the graph in Figure 4E shows the average kinetics of 15 injected embryos and all of them show a transient arrest of closure before showing a collapse or “reverse” of the system. In addition, we have checked the effect of the drug on the microtubule cytoskeleton as observed in Figure 4—figure supplement 2. The observed “arrest” phenotype is consistent with published results in Drosophila, where dorsal closure is also arrested at epidermal seaming stages after colcemid injection (Jankovics and Brunner, Dev Cell, 2006). We have now complemented these experiments with additional live imaging showing similar cell shape changes in the extraembryonic tissues (apico-basal and dorso-ventral elongation in serosa and amnion, respectively) of colcemid treated embryos compared to wild type embryos (Figure 4—figure supplement 2C and C’ and Figure 4—figure supplement 4A-A’’ and corresponding videos 7 and 9). These additional data show that shape changes of serosa and amnion during dorsal closure in M. abdita are not impaired in colcemid-injected embryos, rather, dorsal closure is transiently arrested during serosa internalization, fails to progress and “reverses”, consistent with amnion seaming failure. In addition, UV-deactivation of colcemid in the amnion region rescues partially the closure, indicating a specific role for microtubules in the amnion (Figure 4—figure supplement 3). As mentioned above, these data have been replaced by UV deactivation of colcemid in the amnion area. These additional experiments are consistent with a requirement of the microtubule cytoskeleton in the amnion for dorsal closure progression and support an amniotic seaming. The reviewer questions the anatomical description of cell type based on DNA staining for tissue type characterization. Nuclear anatomy and staining have been previously used to identify extraembryonic tissues in the flour beetle Tribolium castaneum (Panfilio et al., Biol Open, 2013). We extended this method quantitatively by measuring the staining profile, size of DAPI-labeled nuclei and their z position in 150 different cells from at least 15 embryos. A representative image of DAPI-stained cells is now shown in Figure 1—figure supplement 1B. We used the pattern of DAPI staining to discriminate between serosa (discontinuous or “punctuated” staining) and amnion (continuous or “compact”) cells. Representative staining profiles for each cell type are shown in Figure 1—figure supplement 1B’. The measured average size for each cell type are: 125 ± 21 µm2 for serosa cells; 77 ± 16 µm2 for amnion cells and 14 ± 3 µm2 for epidermal cells. These measurements are plotted in Figure 1—figure supplement 1B’’. In addition, spatial localization of extraembryonic cells was used as a descriptor. We observed that amnion cells (medium size nuclei with compact staining) form a 1-2 cell row located adjacent to the epidermis as previously described (Rafiqi et al., 2008), while serosa cells (largest nuclei with discontinuous staining) are homogenously distributed over the surface of the embryo as observed in Figure 1—figure supplement 1A and A’. The different z-position of serosa and amnion cells was used to classify the cells. Serosa cells are more superficial than amnion cells and in some instances serosa cells can be observed on top of amnion cells, this can be observed in Figure 1A’. We would also like to point out that our measurements of nuclear size and staining patterns are obtained from z-confocal images, thus, we know exactly at which z-position the nuclei are. Using these quantitative descriptors (staining profiles, nuclear size and z position) we pseudo-colored in red the nuclei of serosa cells (largest nuclei with discontinuous staining) and in blue the nuclei of amnion cells (medium size nuclei with compact staining). We initially used in situhybridization (ISH) to stain for the marker genes zen (serosa) and pnr (amnion), however, as pointed out by reviewers #1 and #2, these stainings are of low quality and difficult to interpret. ISH stainings were removed from the manuscript as suggested by the reviewers. We believe that the quantitative description of nuclear anatomy between serosa and amnion cells, together with their localization in the embryo, allows us to discriminate between serosa and amnion cells. This quantitative description and the resulting measurements are now explained in more detail in the manuscript with additional images and graphs in the Figure 1—figure supplement 1. 2) Classification of serosa and amnion in Figure 1—figure supplement 1A is puzzling. The red nucleus on top of the third blue nucleus from the right seems to have a size that fits into the amnion category. What is the basis to classify this nucleus as serosal? Is it the density of the DNA stain? It does not become clear by which procedure two qualitatively different parameters (nuclear size and "DNA compactness") were compared if they contradict each other in the classification of a particular nucleus. Probably this is done by some sort of quantitative measure – the authors should comment on this procedure in more detail in the Materials and methods section. As mentioned above, a combination of anatomical parameters was used to classify the nuclei into serosa or amnion. These parameters include DAPIstaining profile (continuous vs. compact), the size of the nucleus (125 ± 21 µm2 vs. 77 ± 16 µm2), the z-position of the nuclei (superficial vs. less superficial) and the spatial localization of the nucleus in the embryo (homogenously distributed in the embryo vs. a 1-2 cell row adjacent to the epidermis). In the specific case of Figure 1—figure supplement 1A, we agree with the reviewer that this image did not reflect the methodology used to classify the nuclei. 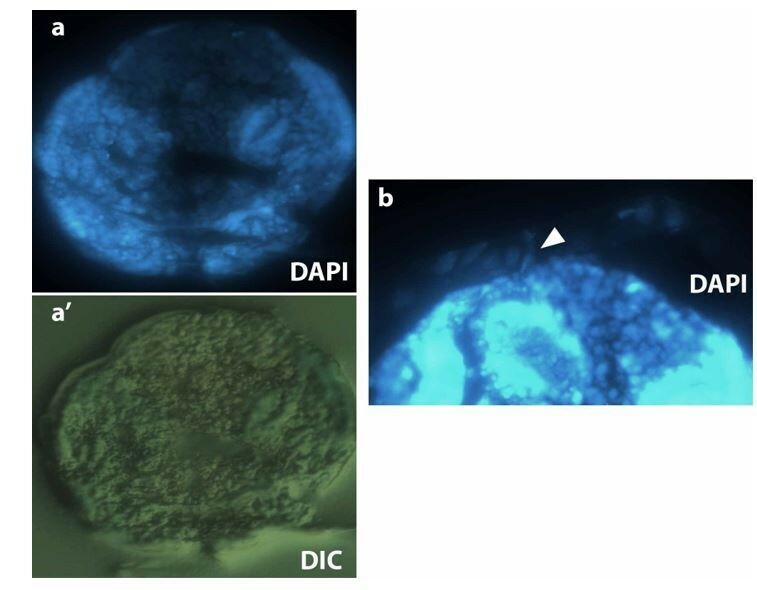 We have replaced this figure with a typical DAPI-stained embryo before and after extraembryonic nuclei identification (Figure 1—figure supplement 1A and A’) and a close-up view of DAPIstained extraembryonic serosa and amnion nuclei and embryonic epidermis, together with the representative staining profile for serosa and amnion cells and the graph of nuclear size measurements (see Figure 1—figure supplement 1B-B’’). This description is now explained with more detail in the Materials and methods section. 3) The density of serosa cells in Figure 1—figure supplement 1A are unexpectedly variable, it seems to be much higher in areas where the serosa covers the ectoderm than in areas covering the interface of amnion and ectoderm, the amnion, or the yolk. In previous publications and other images within this publication (e.g. Figure 1A, Figure 1—figure supplement 2A), the density of serosa nuclei appears to be rather even along the dorsal to ventral circumference of the embryo. Could the authors offer an explanation for this discrepancy? We agree with the reviewer in that the density of serosa cells in Figure 1—figure supplement 1A seems uneven. The initial purpose of Figure 1—figure supplement 1A was to illustrate the difference in nuclear sizes among the three tissue types, for this reason we did not notice a particular uneven distribution of the serosa nuclei in this image, we apologize for this. The uneven distribution of the serosa cells in this image could be due to the fixing treatment affecting the geometry of this particular embryo or simply to inhomogeneities at the particular spatial resolution. We point out that a similar close-up view on Figure 1A could as well result in an apparent inhomogeneous distribution of serosa cells. To avoid misinterpretations we have replaced this image by a representative view of the whole embryo showing the distribution of DAPI-stained serosa amnion and epidermal cells in the new Figure 1—figure supplement 1A-A’ and a representative close-up view of a similar DAPI staining to show the difference in nuclear size in the serosa, amnion and epidermis in Figure 1—figure supplement 1B-B’’. We agree with the reviewer that the staining in the whole mount in situ hybridization (ISH) presented in the manuscript is not very sharp. We think this could be due to the low expression levels of Mab-zen and Mab-pnr at these particular stages. ISHs at this late stage of development (dorsal closure) have not yet been reported. The latest stage of ISH in Megaselia embryos published in (Rafiqi, et al., 2010) is at germband retraction (stage 12, ~ 8 hours after egg laying), while dorsal closure occurs at stage 15 (~ 14-17 hours after egg laying, see Wotton et al., 2014). Recently published ISHs of Megaselia embryos at dorsal closure stage (Kwan et al., eLife, 2016) show that the expression levels of the gene Mab-egr in the amnion decreases towards stage 15 (see Figure 2—figure supplement 3I in Kwan’s paper). Similar decrease could also occur for Mab-pnr and Mab-zen at dorsal closure stage. In any case, we would like to stress that the Mab-zen/Mab-pnr ISHs are a minor point of the manuscript. As suggested by the reviewer 2, we believe these data are not bringing significant information to the manuscript and have not been included in the revised manuscript. 5) The authors suggest that devitellinization results in damage of the dorsal region of the embryo [subsection “Dorsal closure in Megaselia abdita involves synchronized serosa rupture and epidermal progression”, third paragraph], where they do not detect phalloidin staining (Figure 1—figure supplement 2B). This suggest the authors have evidence that the amnion is normally closed at this point of development. This is contradicting the schematic overview in Figure 1B, B'. To clarify, it would be helpful to provide a brief description and maybe a panel with a closed amnion to illustrate the progression of wildtype amnion development. The argument of the reviewer on how our results suggest that we have evidence for a closed amnion during dorsal closure in M. abdita appears unclear to us. We think that our observation of a region on the dorsal side devoid of cells after vitelline envelope removal, rather points towards a model in which only serosa cells covers this gap. This is supported by the fact that we always observe a homogeneous distribution of nuclear sizes attached to the removed vitelline membrane and do not observe amniotic cells on the most dorsal part of the envelope, either in fixed embryos (Figure 1—figure supplement 2A and B) or in live DAPIstained embryos (Figure 1—figure supplement 1C-C’’). We point out that our morphological description of extraembryonic tissues at dorsal closure stage indicates that the amnion is a 1-2 cell row localized adjacent to the epidermis. This is consistent with previous description of the amnion (Rafiqi et al., 2008) and published ISH staining (Kwan et al., eLife, 2016). 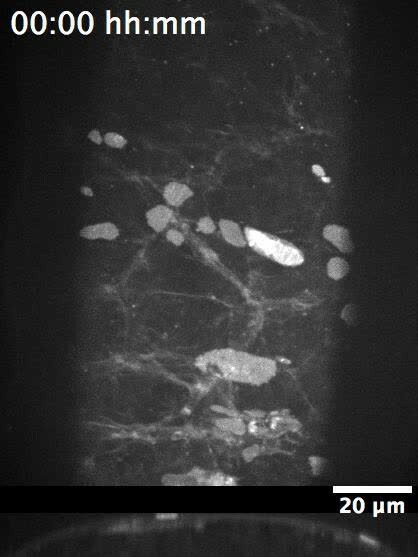 With live imaging, we observe that the amnion cells form a row apposed to the serosa cells and are absent on the dorsal part on top of yolk granules (Figure 1—figure supplement 2C-C’’ and Figure 1—figure supplement 1C-C’’). We also observe that the opposing single rows of amnion cells adjacent to the epidermis undergo elongation upon serosa internalization (Figure 4—figure supplement 4A-A’’ and Video 9) and that these opposing amniotic flanks merge at the dorsal midline after serosa internalization (Figure 3C’’, Figure 4C-C’’ and Figure 4—figure supplement 1C-C’). Altogether, these data point towards a model of an “open” configuration of the amnion at dorsal closure stage in which these cells are a 1-2 cell row adjacent to the epidermis and apposed to the serosa cells as depicted in our schematic overview in Figure 1B-B’ and G-G’’ and in Figure 4F-F’. 6) What is the stage of dorsal closure in Figure 1—figure supplement 2D-D'? In the schematic overview (Figure 1—figure supplement 2E) it seems as if the serosa still envelopes most part of the embryo. The embryo shown in 2D-D' seems to be older and serosa internalization well under way, corresponding to the schematic overview in Figure 1G'. The authors explain that serosa tissue can be lost during devitellinization, suggesting that they used alternative landmarks to stage dorsal closure progression. It would be helpful if they could comment on their use of landmarks and how the embryo in 2D-D' was staged. The embryo shown in the old Figure 1—figure supplement 2D-D’ is at an early stage of dorsal closure, prior to serosa rupture. We apologize for not mentioning the landmarks used to stage this specific embryo. The general staging landmarks were mentioned before in the manuscript and include: a) the fusion of the dorsal ridge at the most anterior part of the embryo prior to serosa rupture (see time of dorsal ridge fusion depicted by a pink bar in Figure 1F and red curve depicting serosa area covering the embryo, as well as red bar landmarks in Figure 1—figure supplement 3A-A’’); and b) the height (h) of the dorsal opening (see blue curve in Figure 1F and yellow lines and blue bar in Figure 1—figure supplement 3A-A’’). In the case of the old Figure 1—figure supplement 2D-D’ (new Figure 1—figure supplement 2C-C’’), the dorsal ridge is fused but the height of the opening is still very large, indicating that the embryo is within 30 min after fusion of the dorsal ridge (following the graph in Figure 1F). Also, older embryos in which serosa internalization is well under way, show an increased phalloidin staining due to F-actin accumulation at the most dorsal part of the embryo as observed in Figure 3A and C and Figure 3—figure supplement 1A. As suggested by reviewer #1, we removed the old schematics of Figure 1—figure supplement 2E since our results do not show an amnion-serosa attachment, but rather indicate an apposition. As a result, we have modified the Figure 1—figure supplement 1 and the mentioned image now corresponds to Figure 1—figure supplement 2C-C’’ and the staging landmarks are mentioned more explicitly in the figure legend of the revised manuscript. 7) The authors suggest that amnion and serosa share a junction or attachment site [subsection “Dorsal closure in Megaselia abdita involves synchronized serosa rupture and epidermal progression”, third paragraph]. The increase of phalloidin staining in Figure 1—figure supplement 2D' is sufficient evidence that the cell with blue arrow touches the cell with white arrow. A blob of actin does not provide evidence for junctions, and the black lines indicating amnion-serosa attachment in schematic in Figure 1—figure supplement 2E may be interpreting the available data a bit too much. We agree with the reviewer and apologize for our overinterpretation of the data regarding amnion and serosa apposition. As mentioned above, we have modified the figures and text in the manuscript to replace serosa-amnion attachment to serosa-amnion apposition. We have followed the reviewers’ advice and extracted optical sections (through confocal stack re-slicing) along the anterio-posterior (AP) axis (sagittal sections) and orthogonal sections at anterior, mid and posterior positions perpendicular to the AP axis (cross sections). These optical sections were obtained from images presented in the previous Figure 3—figure supplement 1C-C’’’ (phalloidin-DAPI stainings) and represent different stages of dorsal closure from serosa dorsal accumulation to epidermal seaming. These sections are now shown in a new Figure 1—figure supplement 4. We can observe through sagittal sections that serosa cells undergo internalization in the mid region of the dorsal opening (black arrowheads in a, b and c) and on the anterior and posterior sections, we can observe layers of cells under the superficial amnion layer corresponding to the internalizing serosa (c, c’, c’’’). Once the serosa cells have been fully internalized and the amniotic flanks have fused, the opposing epidermal leading edges move towards the dorsal midline and undergo epidermal seaming. Both the sagittal section (d) and the cross section at the mid position on the dorsal midline (d’’) show an even layer of epidermal cells followed by an uneven layer of extraembryonic cells underneath, indicating that extraembryonic cells do not accumulate under the closed epidermis (compared to the previous stage shown in c and c’’) and are rather removed, probably, in a similar fashion to the amnioserosa in Drosophila dorsal closure. 5 to show the schematics in one sequence from the initial three-tissue configuration to the end of dorsal closure when epidermal seaming occurs and the extraembryonic amnion and serosa internalize. We included the information pointed out by the reviewers in the Materials and methods section of the manuscript. In summary, colcemid was injected during dorsal ridge fusion and prior to serosa rupture. Embryos were injected 30 min before imaging and UV-irradiation was performed during serosa dorsal accumulation and the initiation of internalization (i.e.approximately 20 min after serosal rupture). The ROI for UV-irradiation was created using the freehand selection tool in Leica software. We have now included the video associated to Figure 4—figure supplement 4 (new Video 10), where we can observe the rescue effect of UV-irradiation on a colcemid-injected embryo compared to a “non-irradiated” colcemid-injected embryo. “We observe that microtubule polymerization does not occur in colcemid-injected embryos (blue and white arrowheads for amnion and epidermal cells, respectively, in Figure 4—figure supplement 2D compared to 2D’) and that amnion cells initially elongate towards the dorsal midline as in wild type conditions, although they relax and retract from the amnion merging site (Figure 4—figure supplement 4A and Video 9). […] Our results indicate that serosa contraction contributes to bringing amniotic flanks into close proximity and that amniotic seaming is a microtubule-dependent event”. We would like to thank Eva Jiménez-Guri, Karl Wotton, and Arturo D’Angelo for reagents and invaluable technical advice during the development of the project. We thank Steffen Lemke for providing training and technical advice as well as Jordi Casanova and Petra Stockinger for discussions and critical reading of the manuscript. All confocal imaging was done at the CRG Advanced Light Microscopy Unit. JJF-Z was supported by a CRG International Interdisciplinary Postdoctoral Programme (INTERPOD) fellowship, co-funded by Marie Curie Actions. We acknowledge support from the Spanish Ministry of Economy and Competitiveness to the EMBL partnership, 'Centro de Excelencia Severo Ochoa', the, Plan Nacional BFU2015-68754-P (MINECO) and the CERCA programme/Generalitat de Catalunya. © 2018, Fraire-Zamora et al. Extraembryonic tissues contribute to animal development, which often entails spreading over embryo or yolk. Apart from changes in cell shape, the requirements for this tissue spreading are not well understood. Here, we analyze spreading of the extraembryonic serosa in the scuttle fly Megaselia abdita. The serosa forms from a columnar blastoderm anlage, becomes a squamous epithelium, and eventually spreads over the embryo proper. We describe the dynamics of this process in long-term, whole-embryo time-lapse recordings, demonstrating that free serosa spreading is preceded by a prolonged pause in tissue expansion. Closer examination of this pause reveals mechanical coupling to the underlying yolk sac, which is later released. We find mechanical coupling prolonged and serosa spreading impaired after knockdown of M. abdita Matrix metalloprotease 1. We conclude that tissue–tissue interactions provide a critical functional element to constrain spreading epithelia.